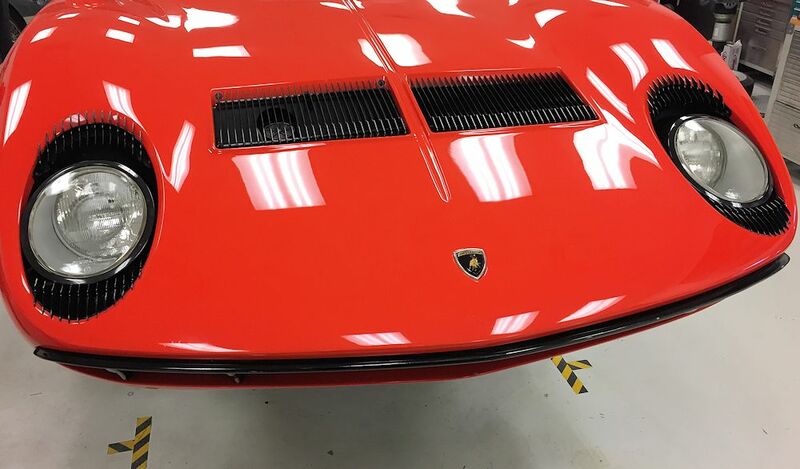 We are delighted to have been entrusted with the care and servicing of this beautiful Lamborghini Miura P400. 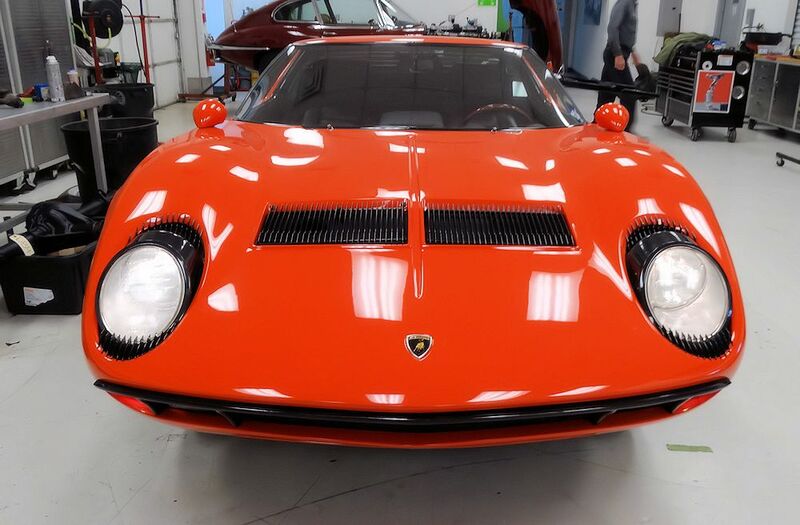 We are currently attending to various point of originality under the guidance of Andrew Romanowski and Valentino Balboni. 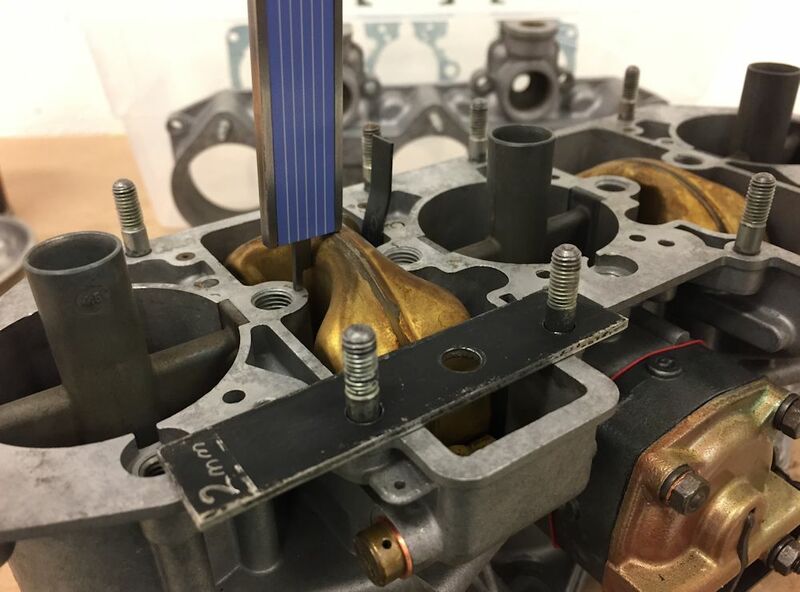 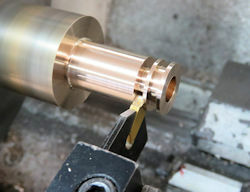 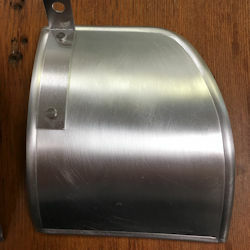 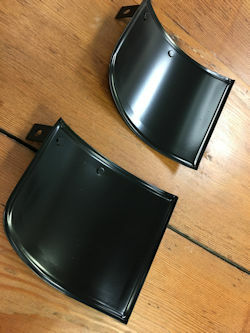 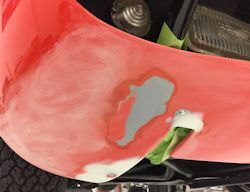 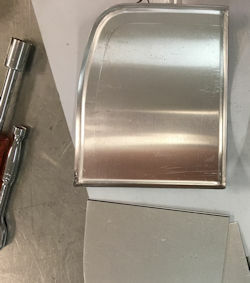 We have been busy fabricating bonnet and engine cover stay cables and bushings, a heat shield for the oil sending unit, a 'leather; cover for the fuse box, as well as installing the correct indicator stalk and other sundry items. 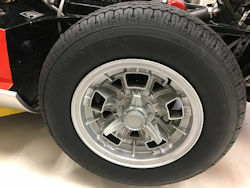 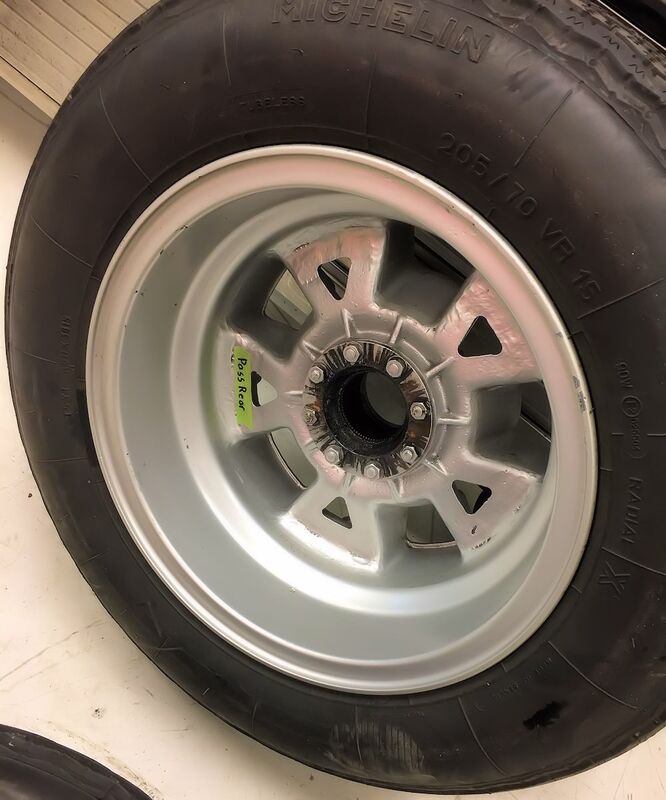 On this visit we have also installed the correct Pirelli Cinturato tires and painted (rather than chromed) wheel knock-offs. 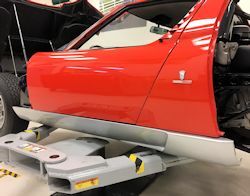 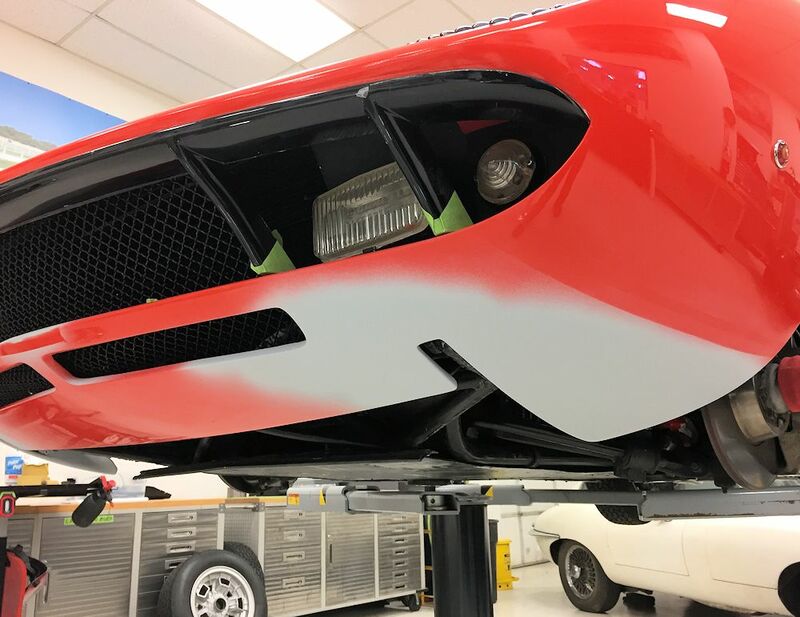 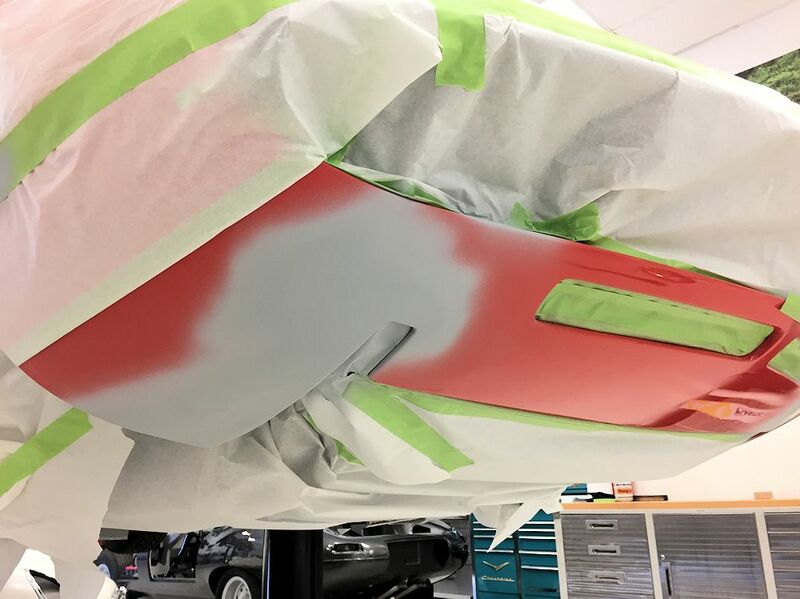 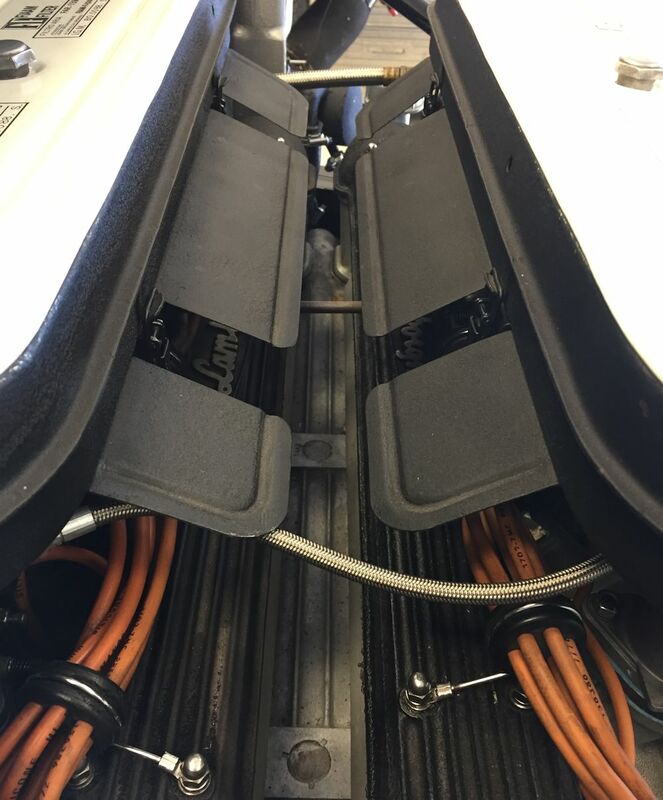 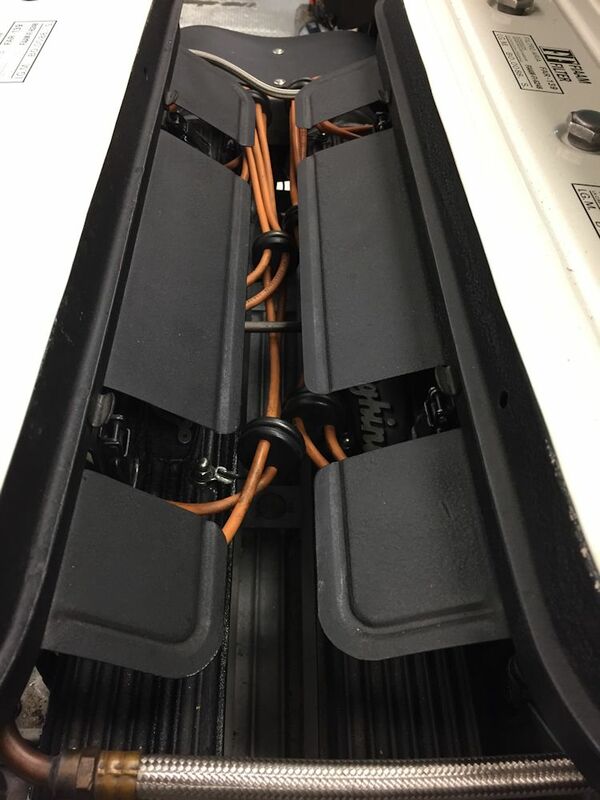 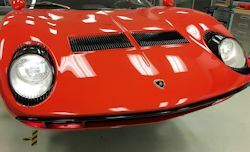 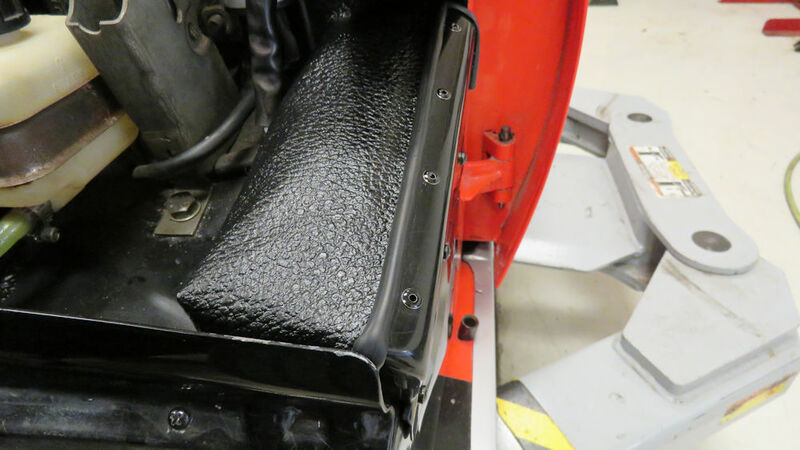 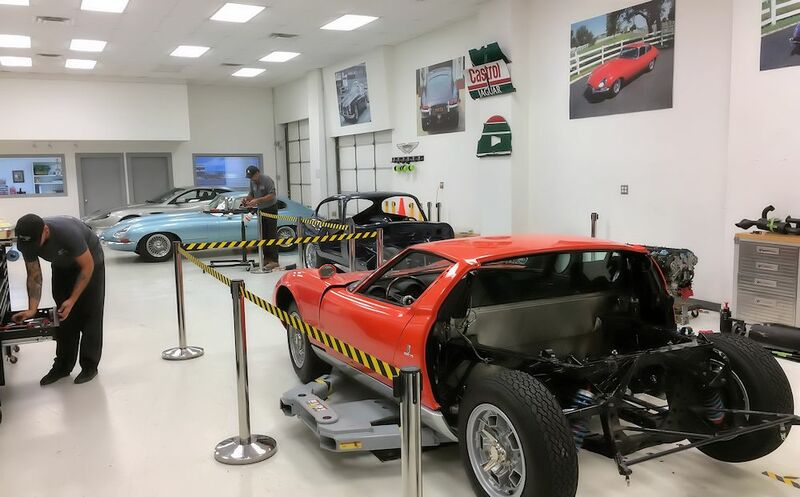 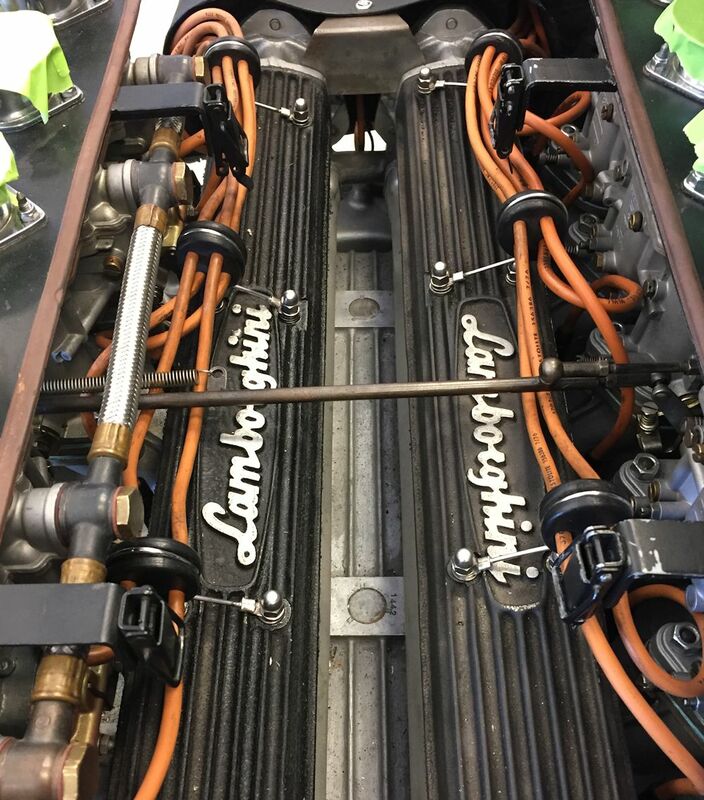 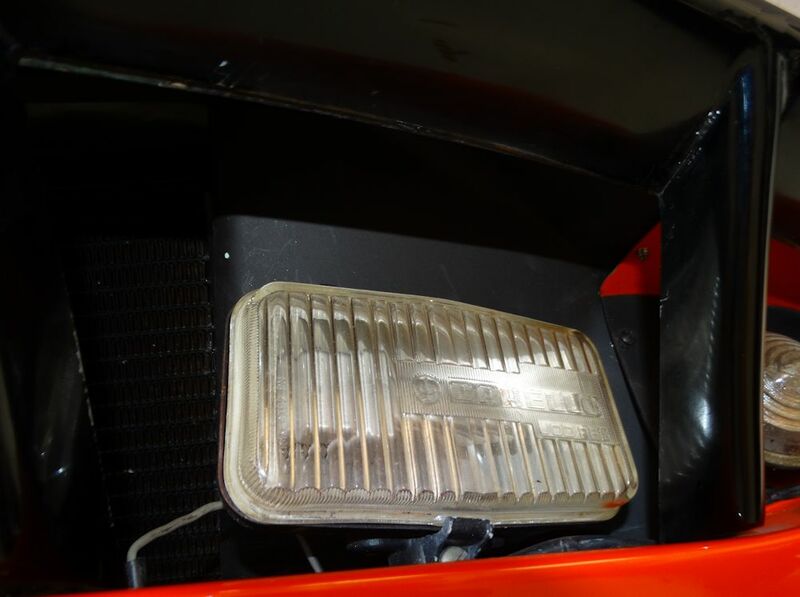 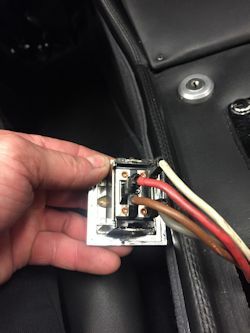 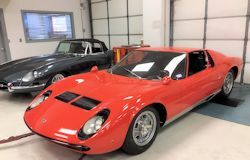 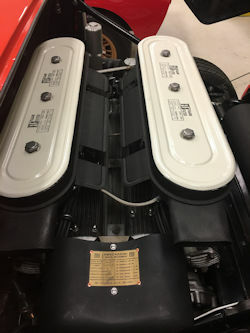 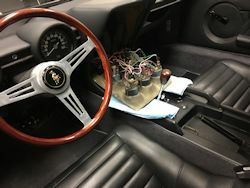 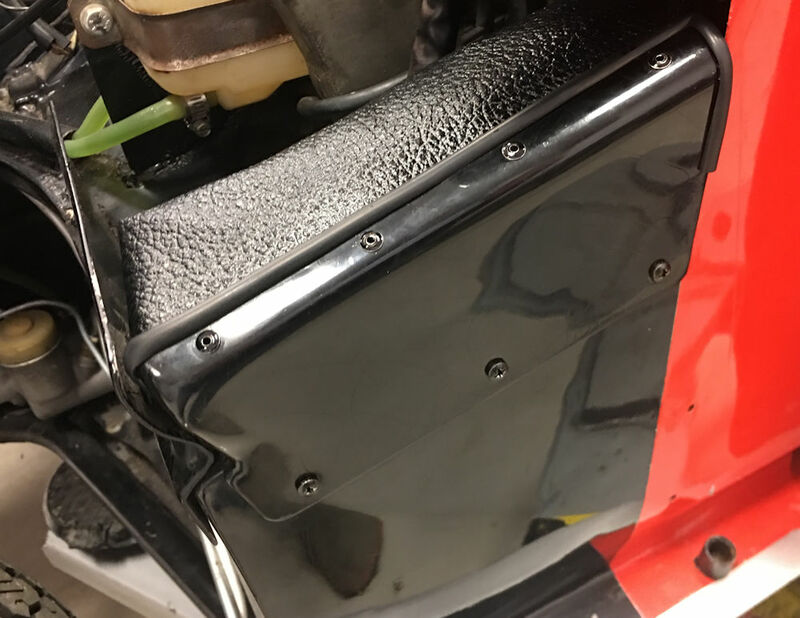 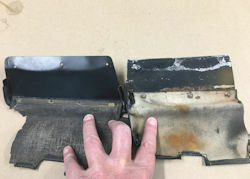 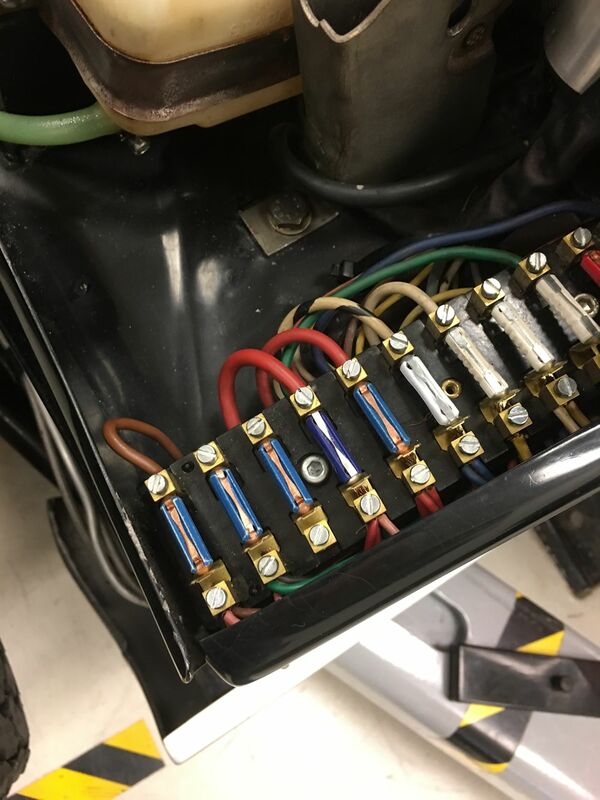 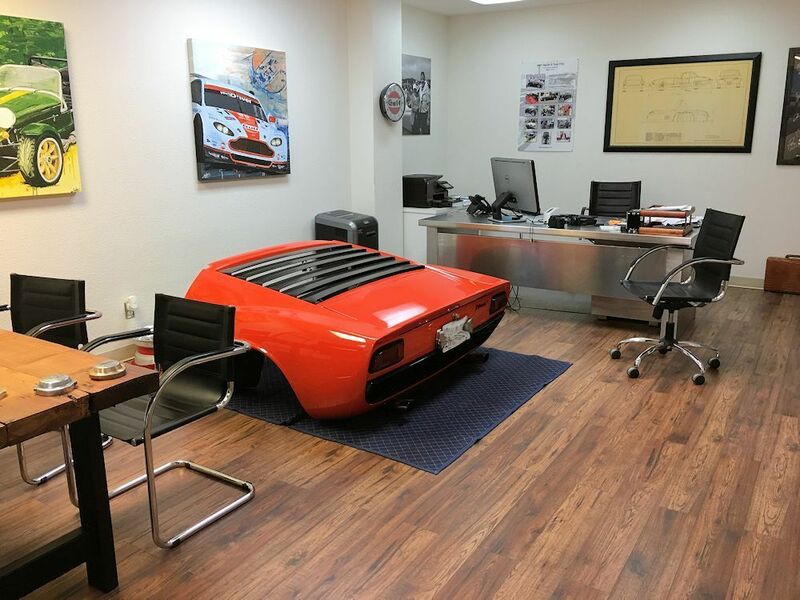 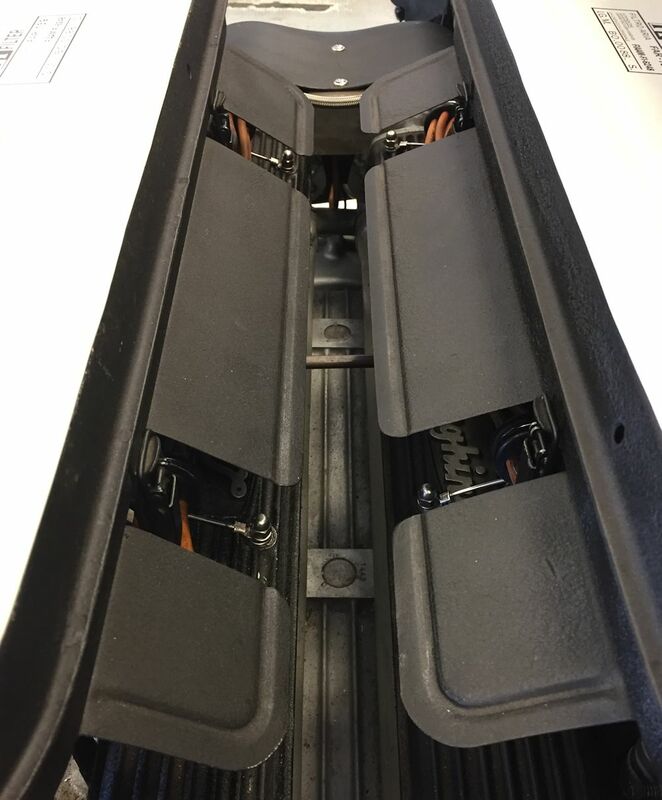 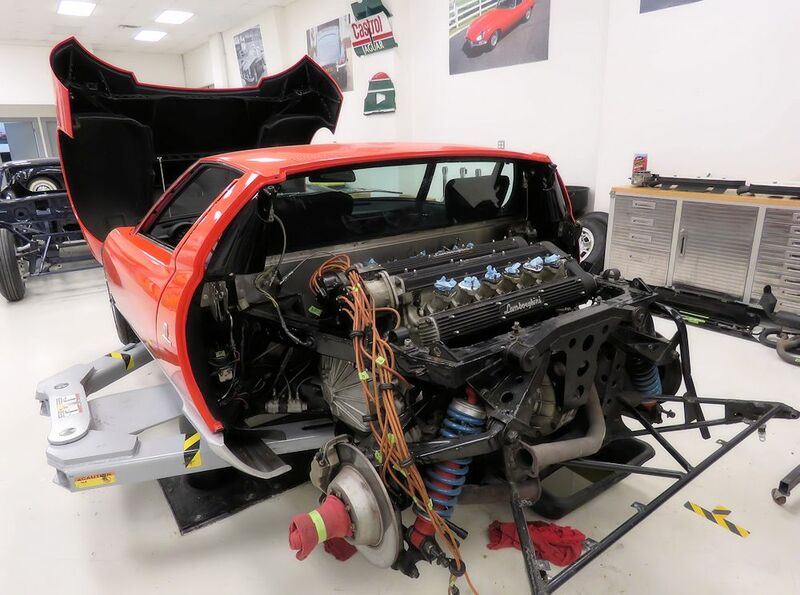 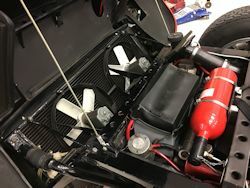 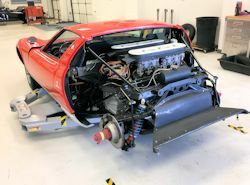 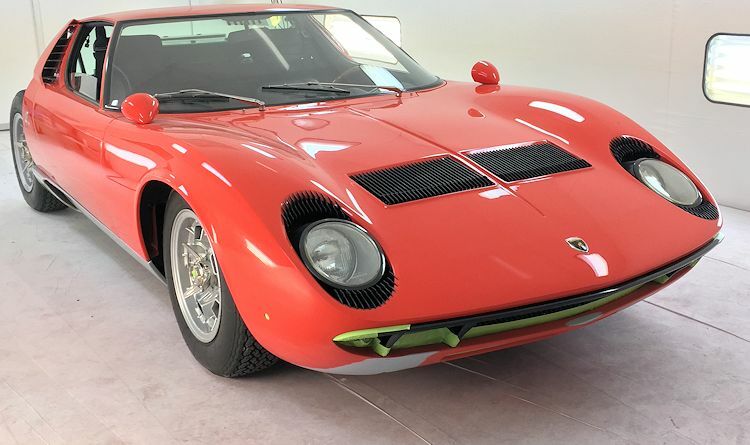 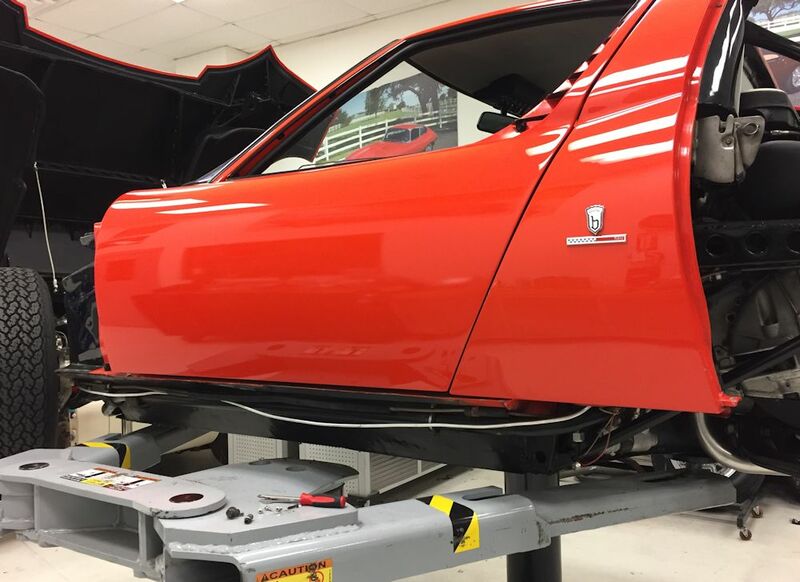 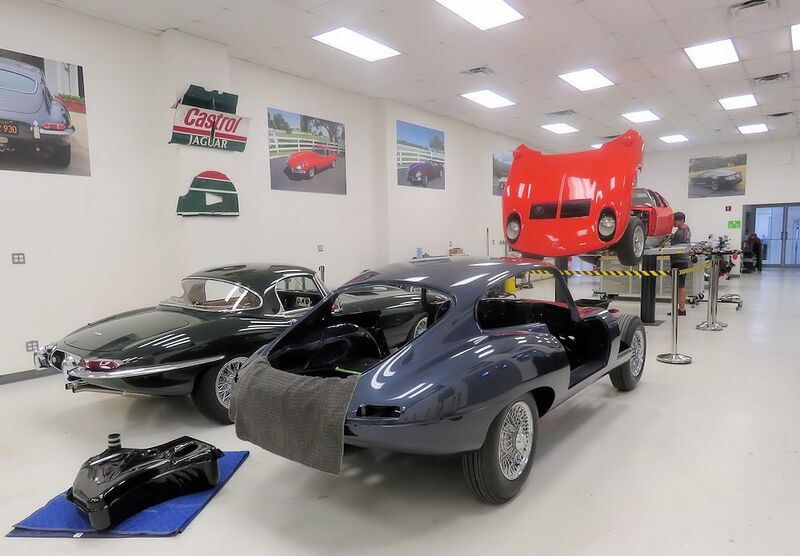 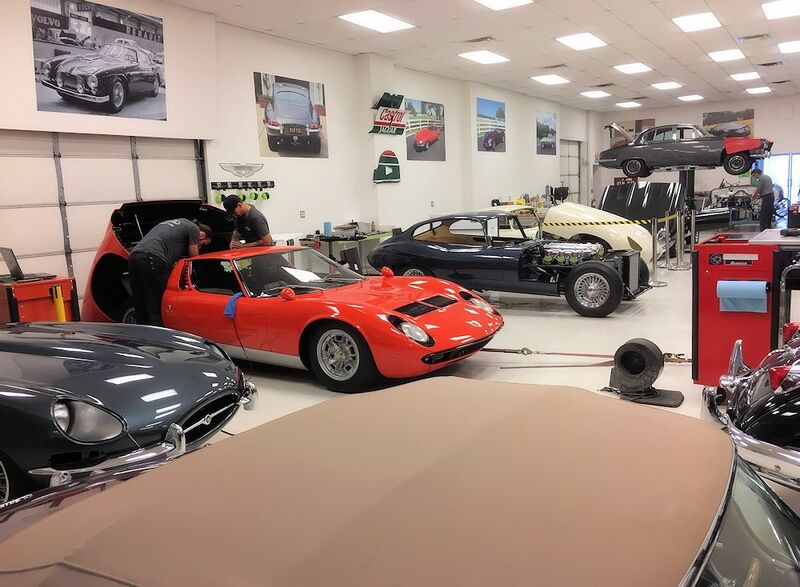 Thanks to Andrew Romanowski of Lamborghini Club America who loaned us a pair of fuse box covers to copy, as our Miura was missing its 'leather' cover. 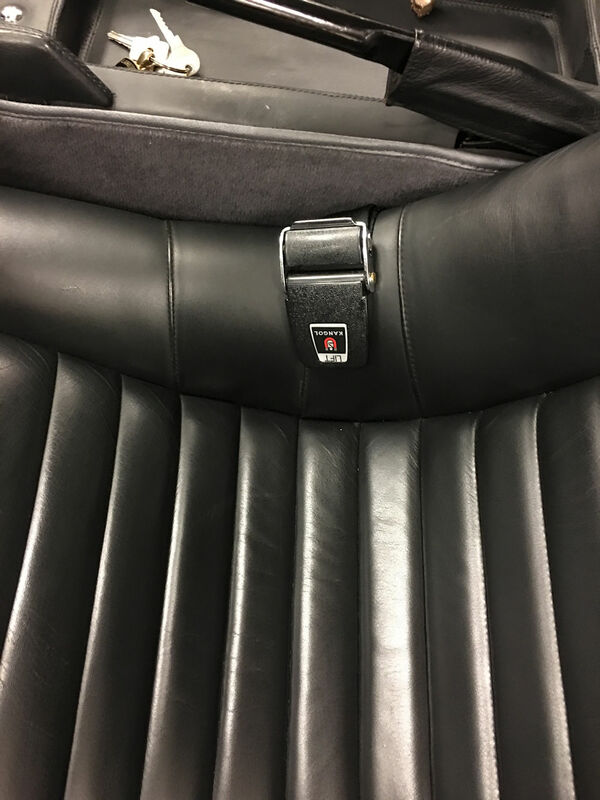 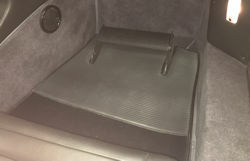 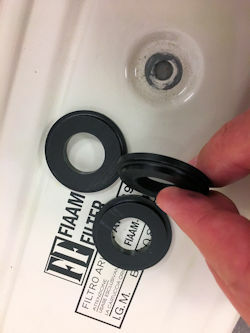 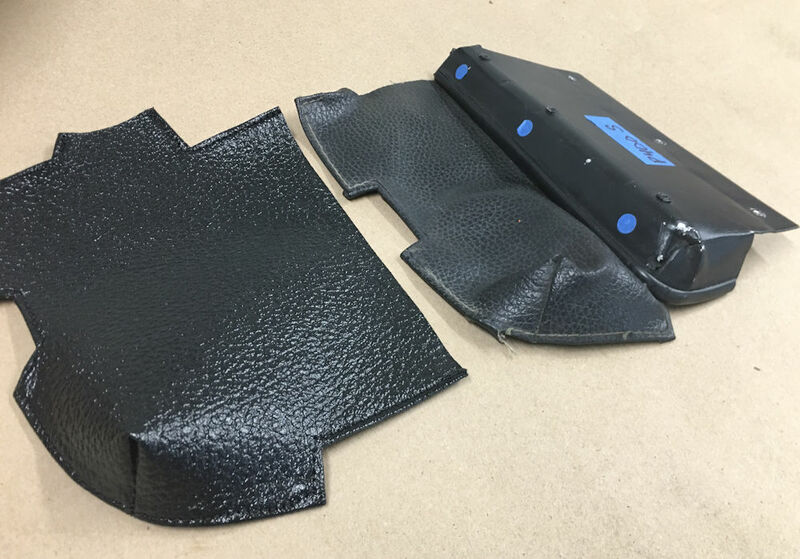 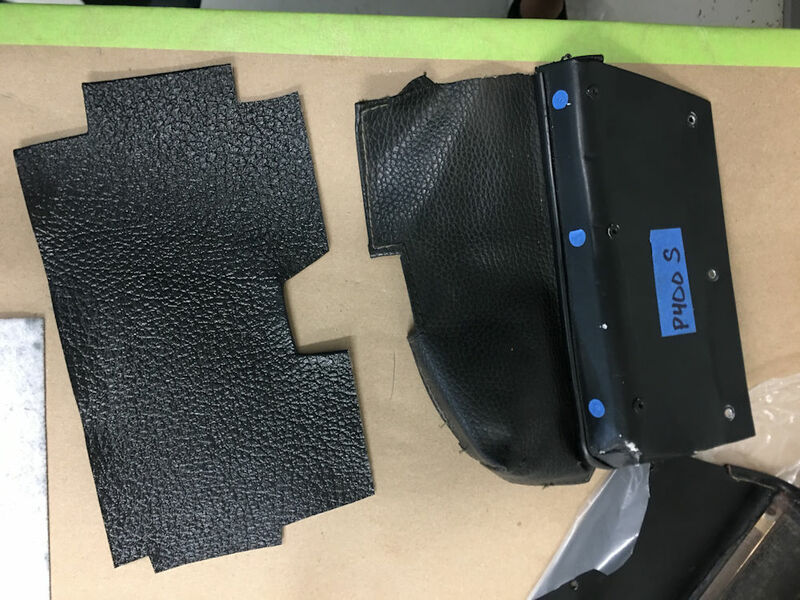 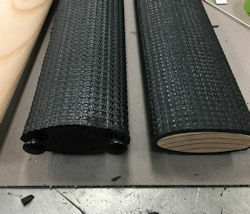 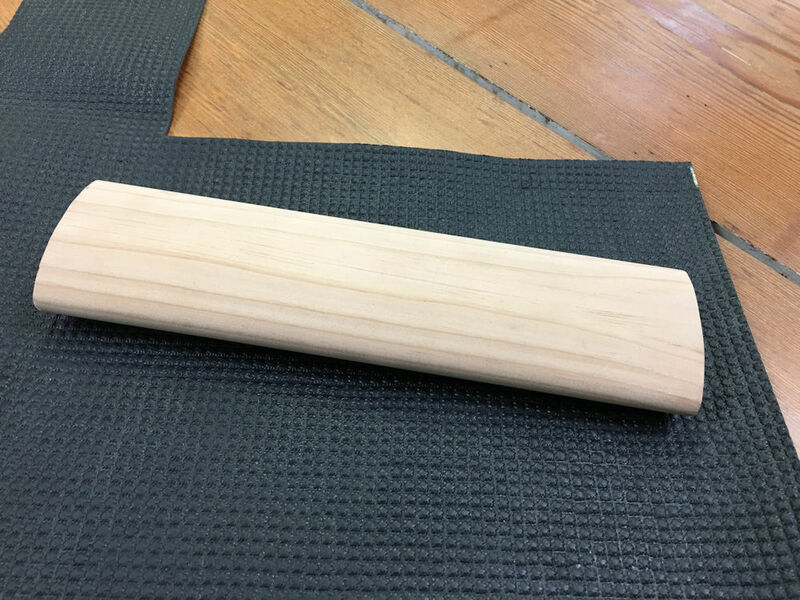 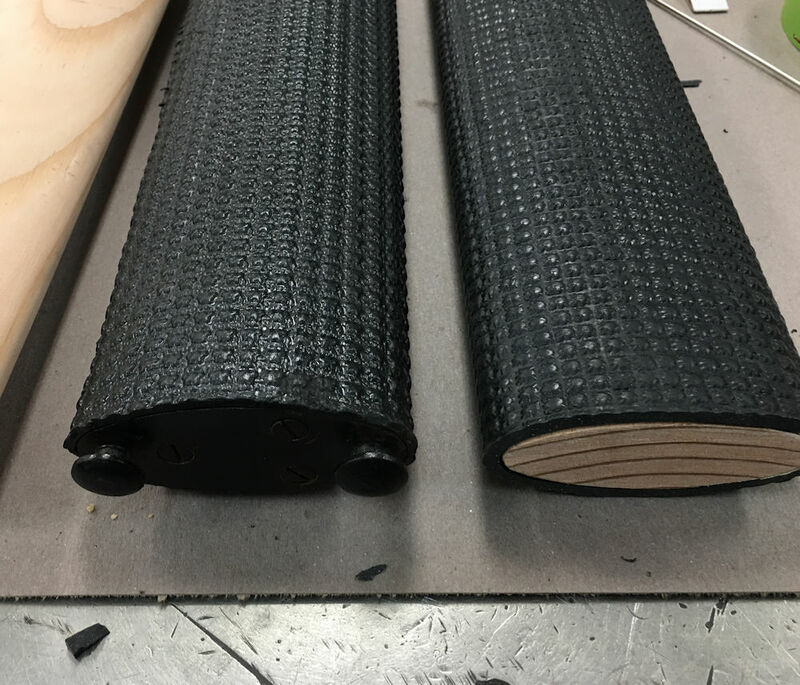 Although often referred to as 'leather' fuse covers, they are actually made of heavy grained black vinyl. 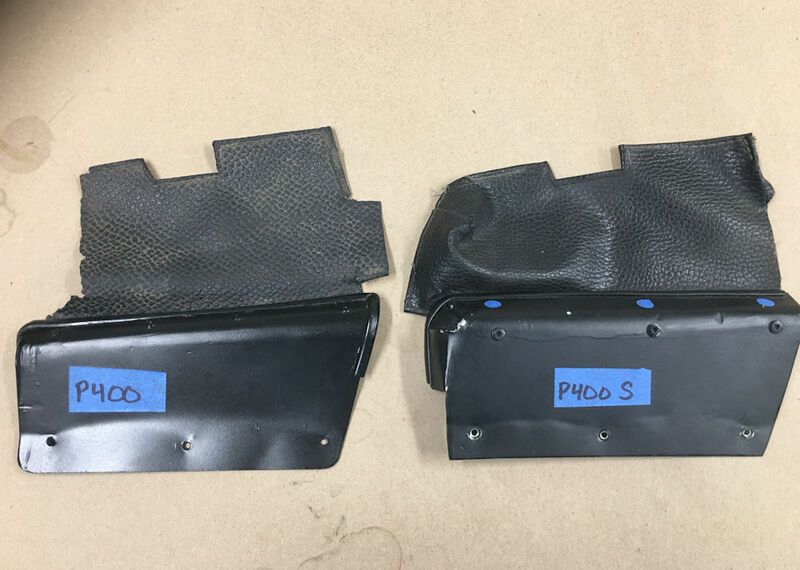 The P400 and P400S covers are very slightly different so we created templates for both, for future reference. 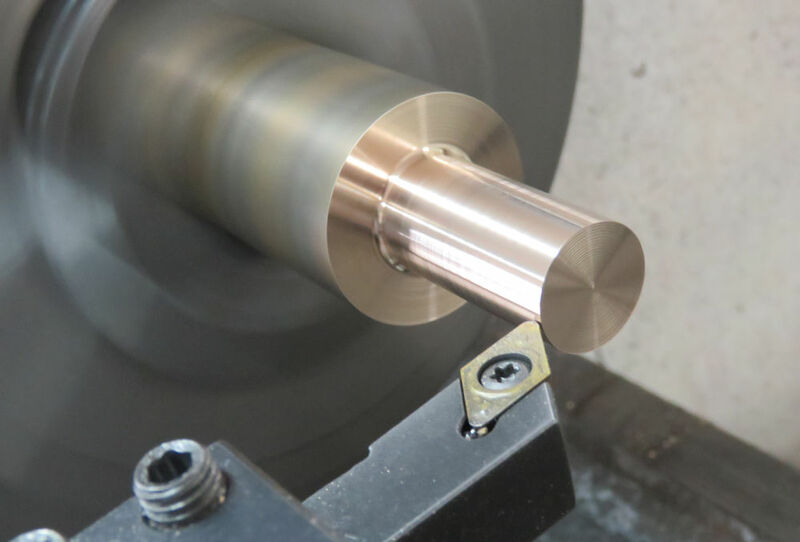 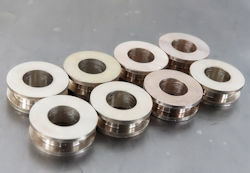 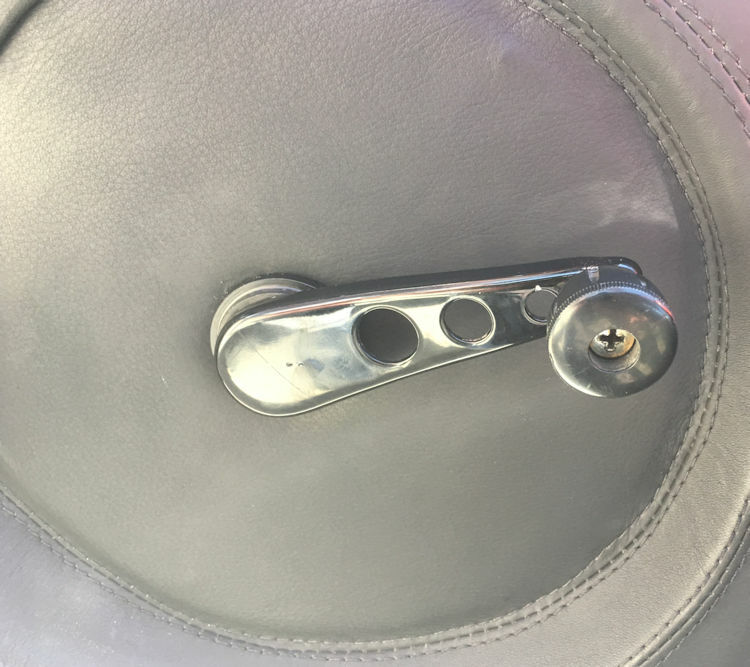 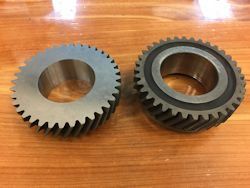 We also machined new Delrin escutcheons that sit behind the window cranks as we were missing the one for the driver's door. 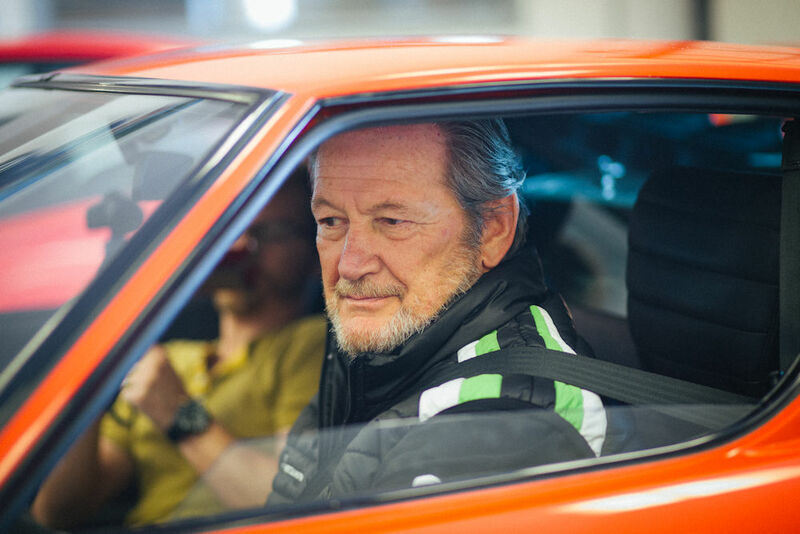 We were honored to receive a visit from the maestro himself, Valentino Balboni, earlier this week. 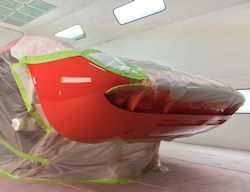 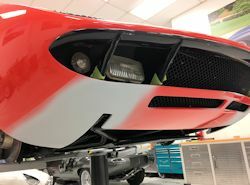 He was kind enough to spend some time going over the Miura and making some suggestions and recommendations to the Team CJ crew. 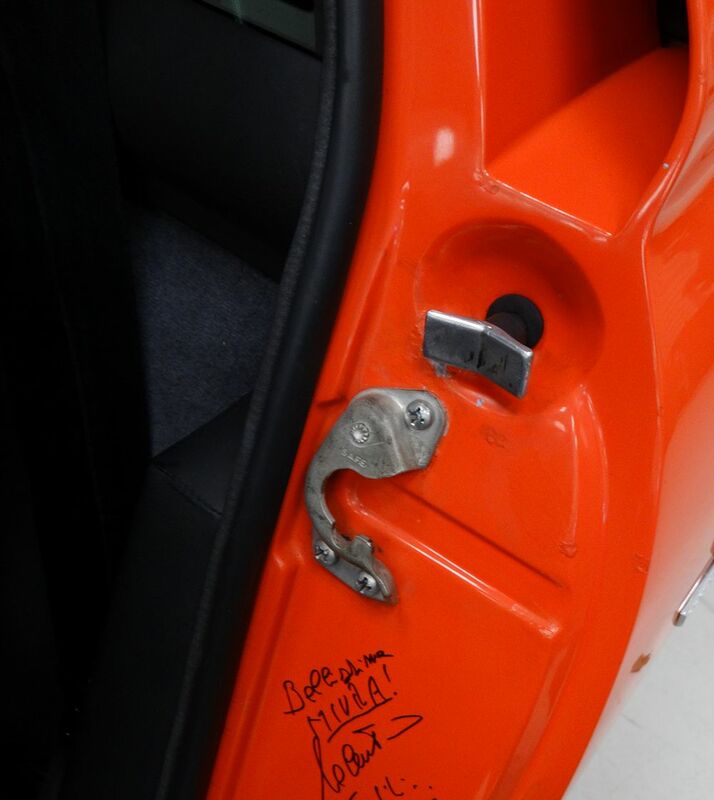 Needless to say, he also test drove the car and gave it his official seal of approval! 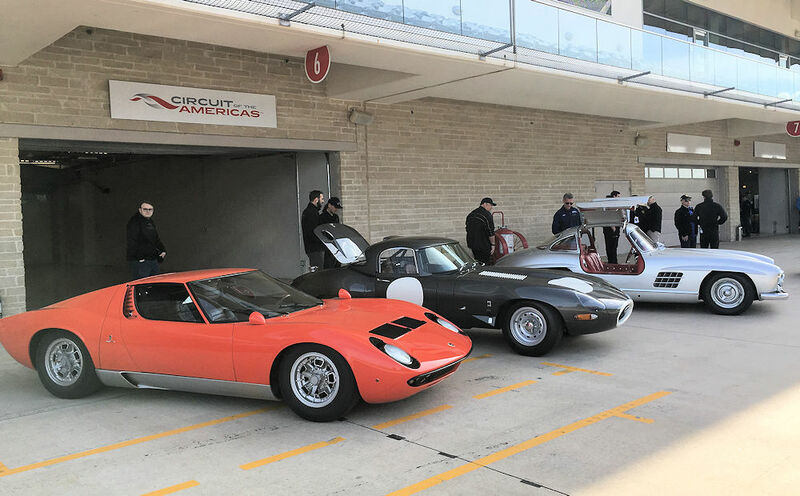 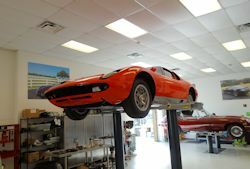 Today the Miura was one of three cars in our care that we took to COTA to support the Drive and Give charity event. 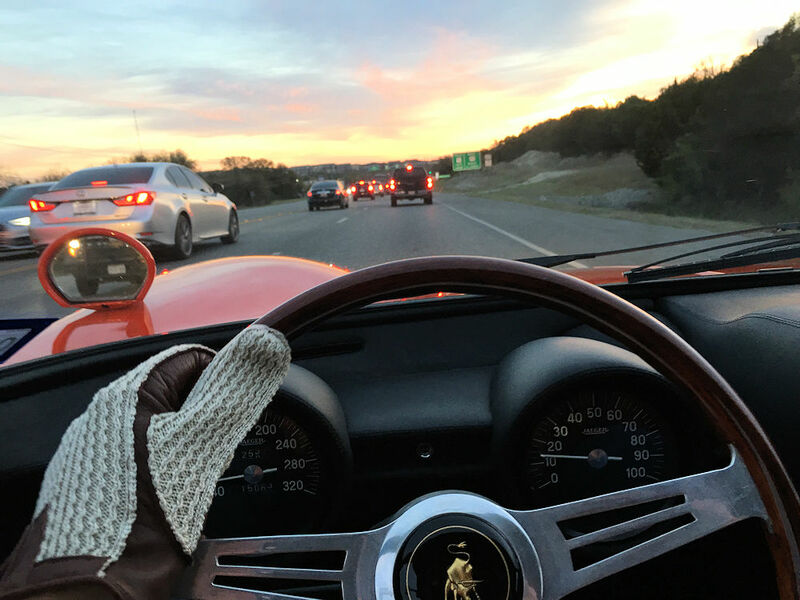 I am happy to report that the car drove and performed flawlessly, even in Austin's infamous traffic! 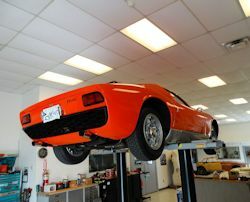 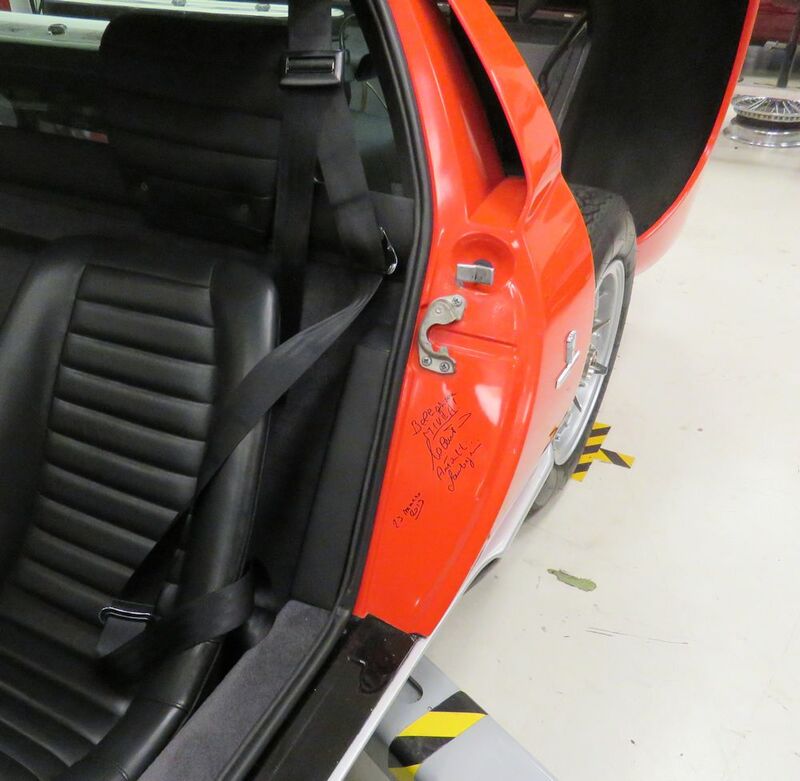 Attending to a few more items on the Miura ahead of our visit from Lamborghini legend Valentino Balboni next week. 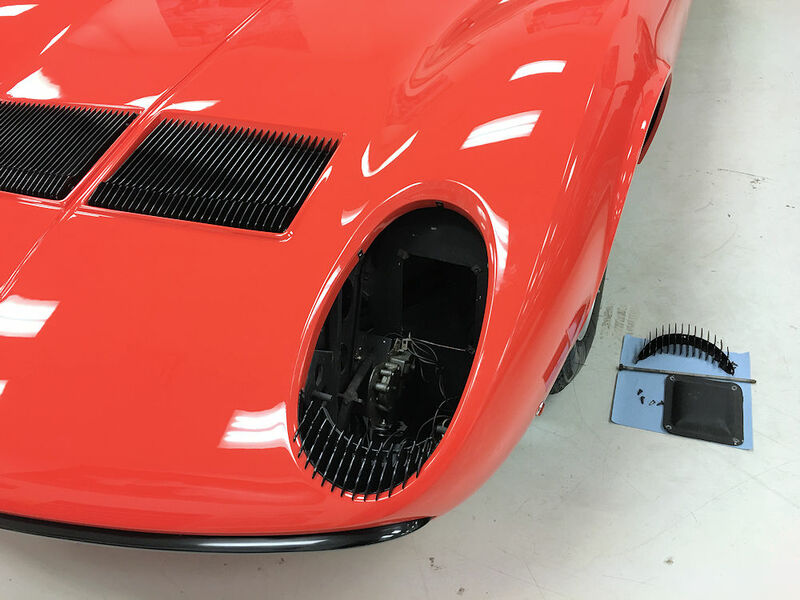 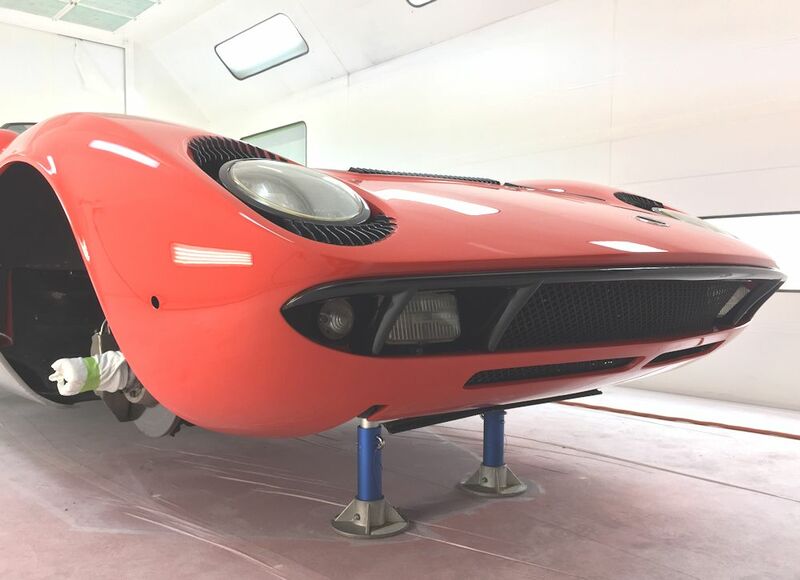 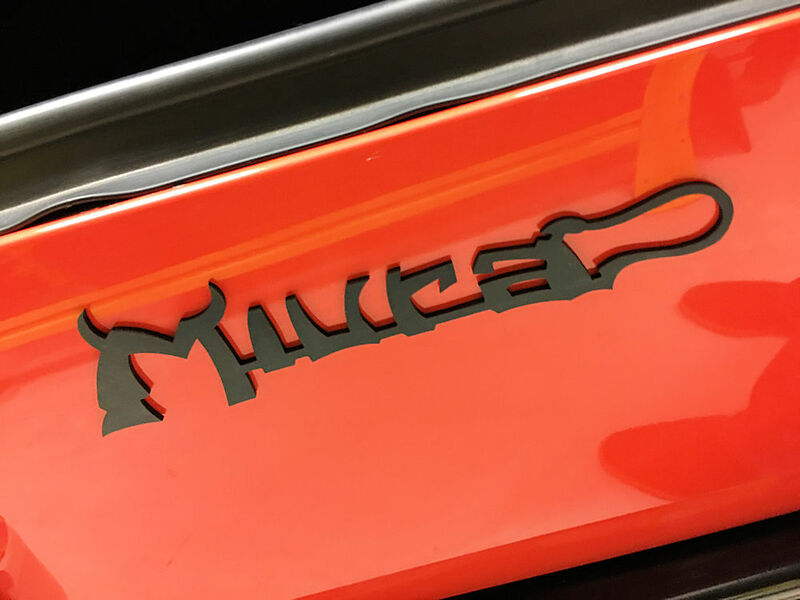 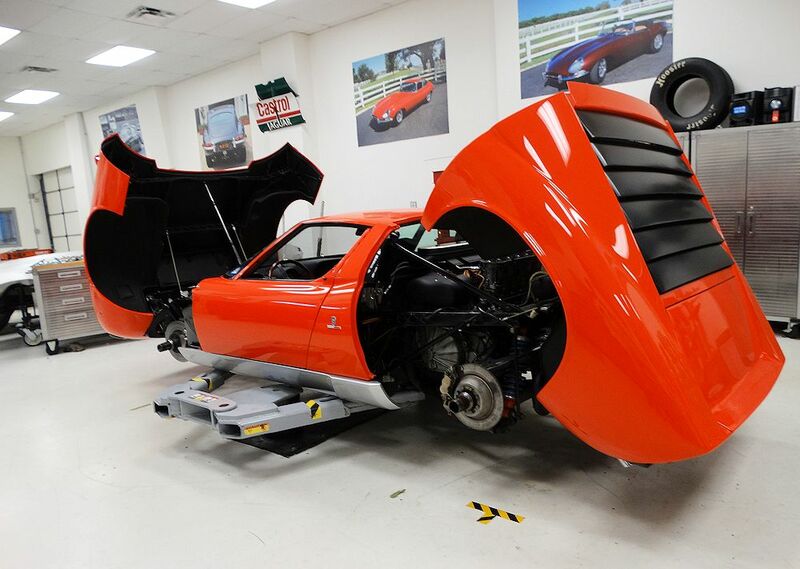 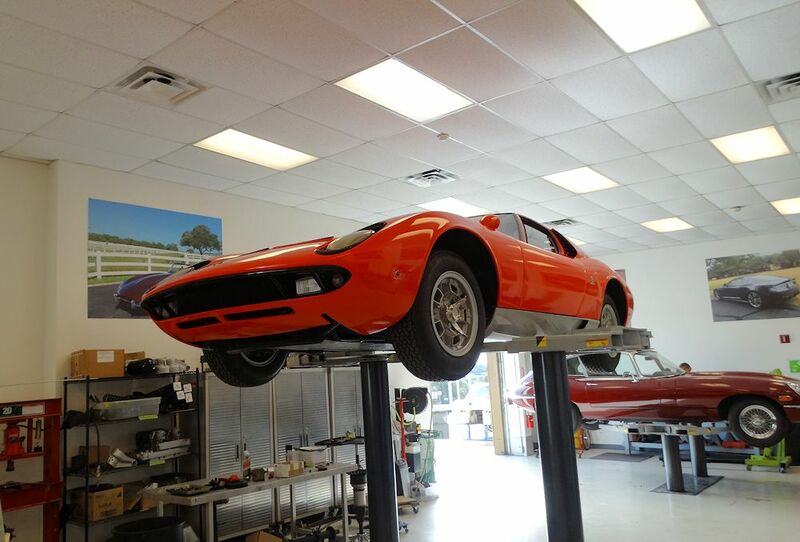 We have been spending some quality time with the Miura correcting a few originality issues and fabricating some previously missing components. 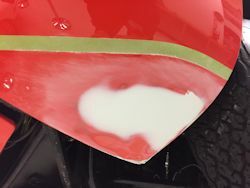 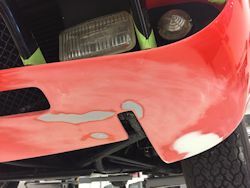 The paintwork repairs to the lower valance have now been completed. Performing some minor body repairs beneath the nose of the car. 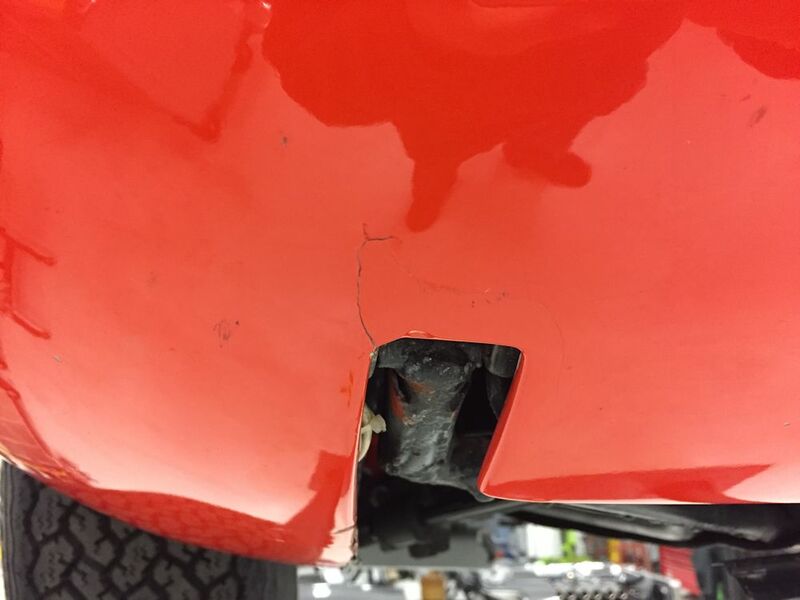 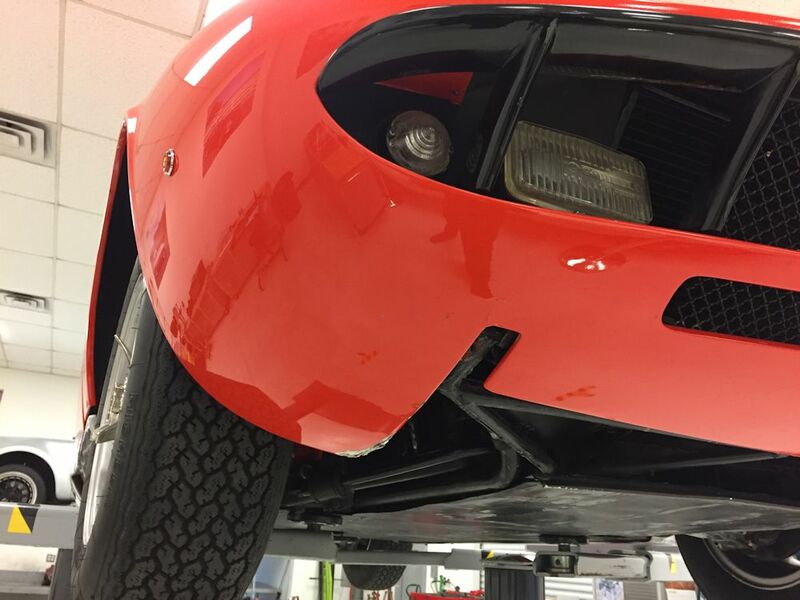 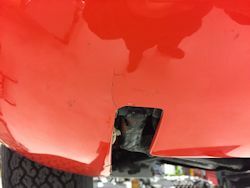 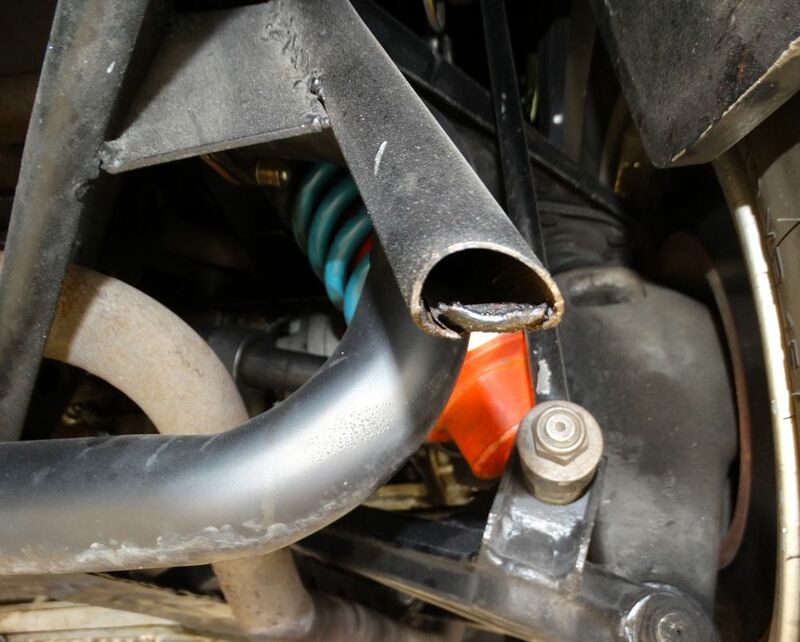 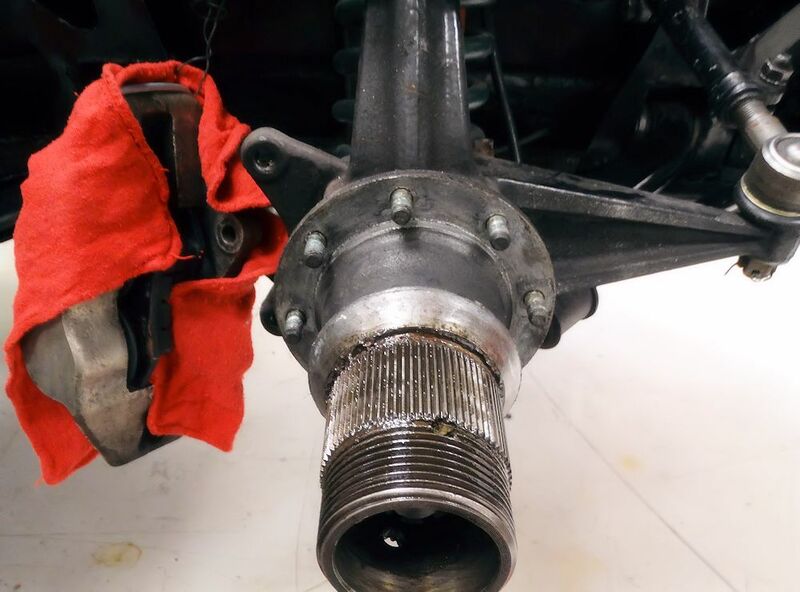 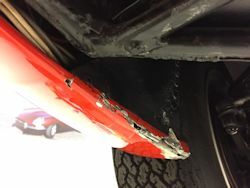 Prior to replacing the old shock absorbers, the front end had been bottoming out and causing damage to the lower valance. 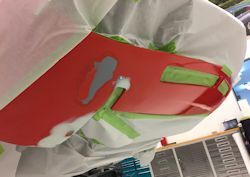 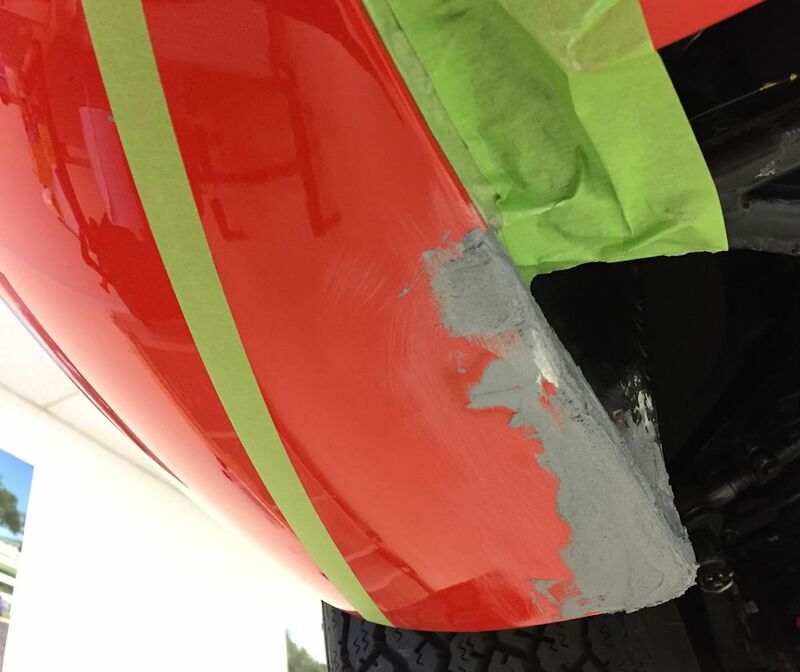 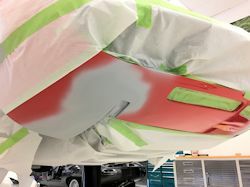 Our repairs are now virtually complete and we expect to be painting the valance early next week. 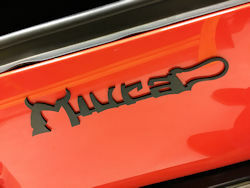 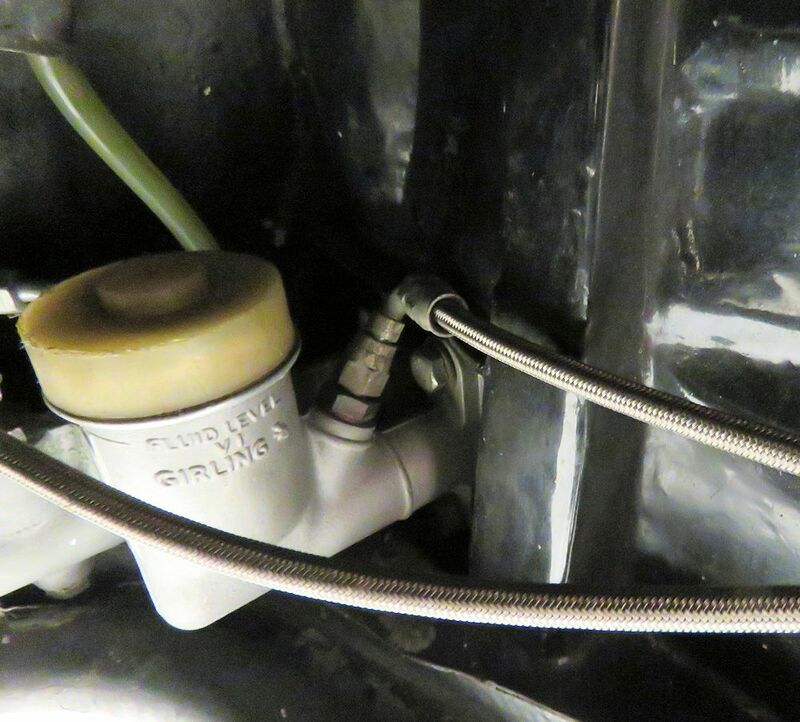 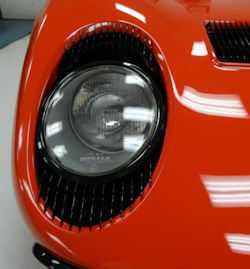 Today's update outlines the correction of a couple of issues related to the Miura plug wires. 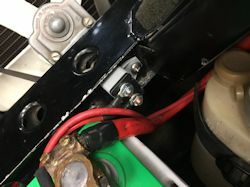 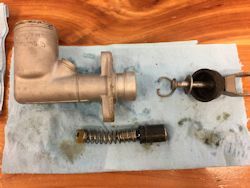 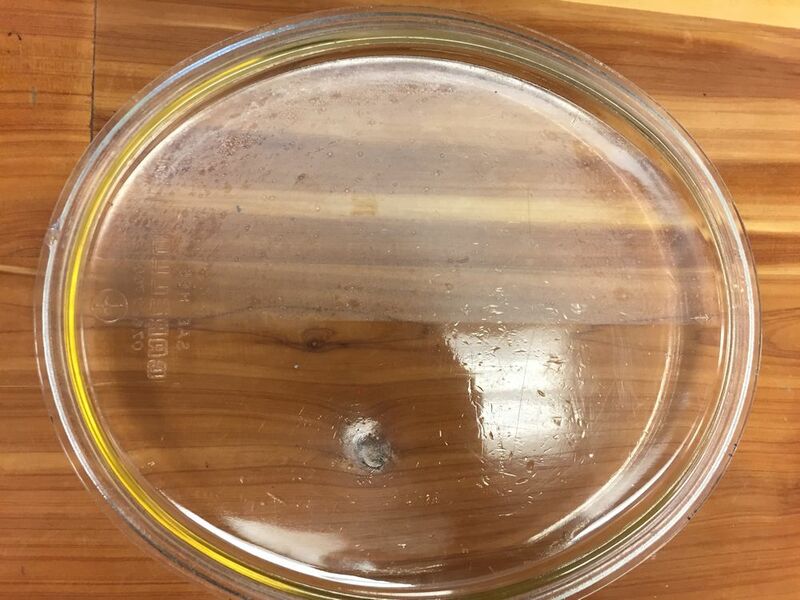 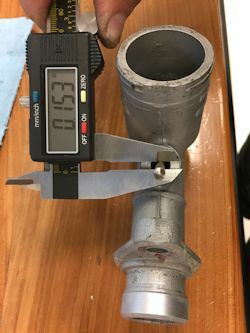 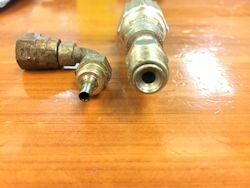 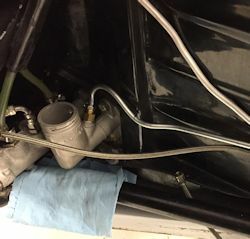 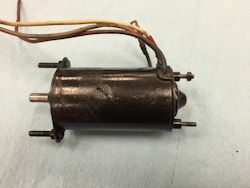 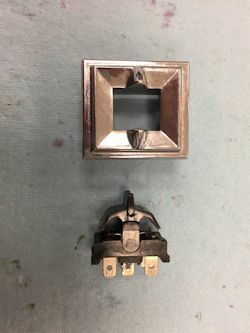 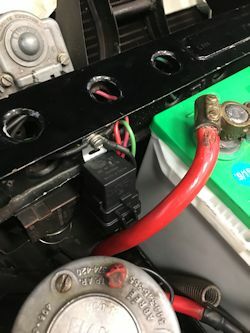 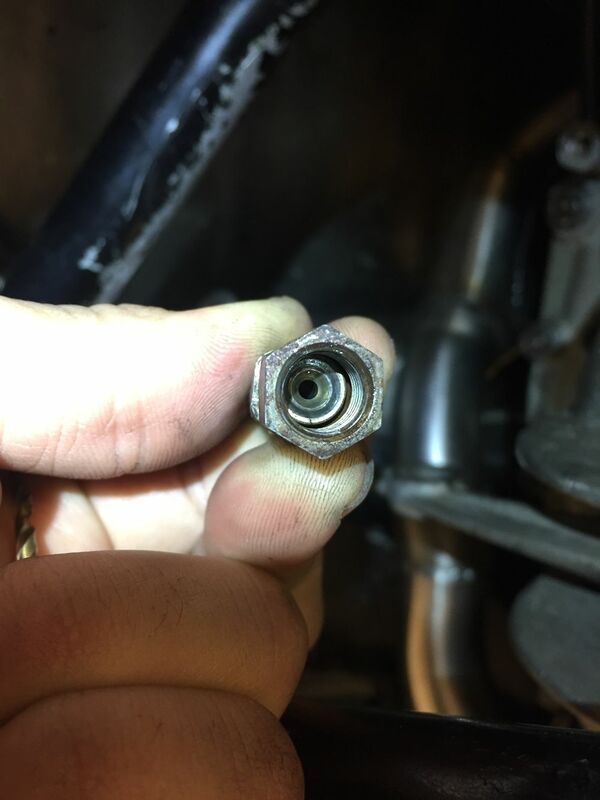 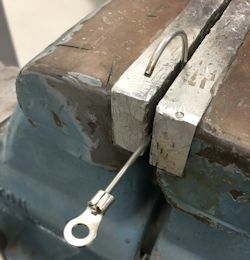 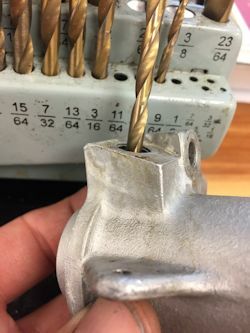 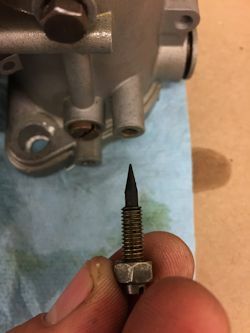 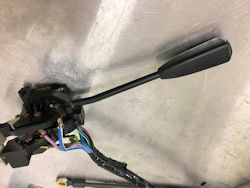 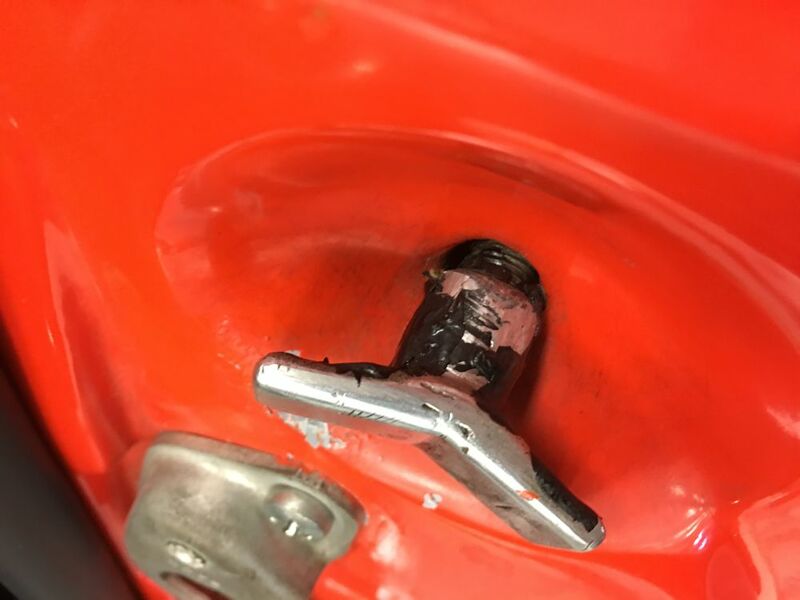 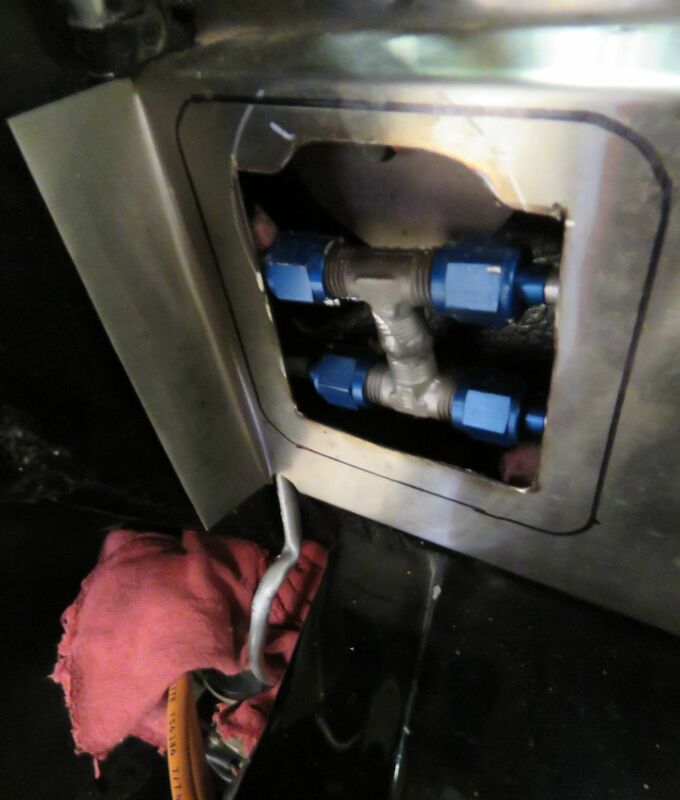 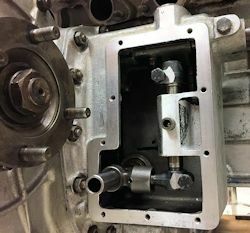 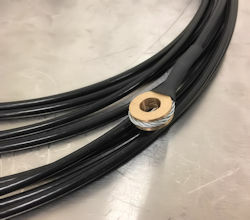 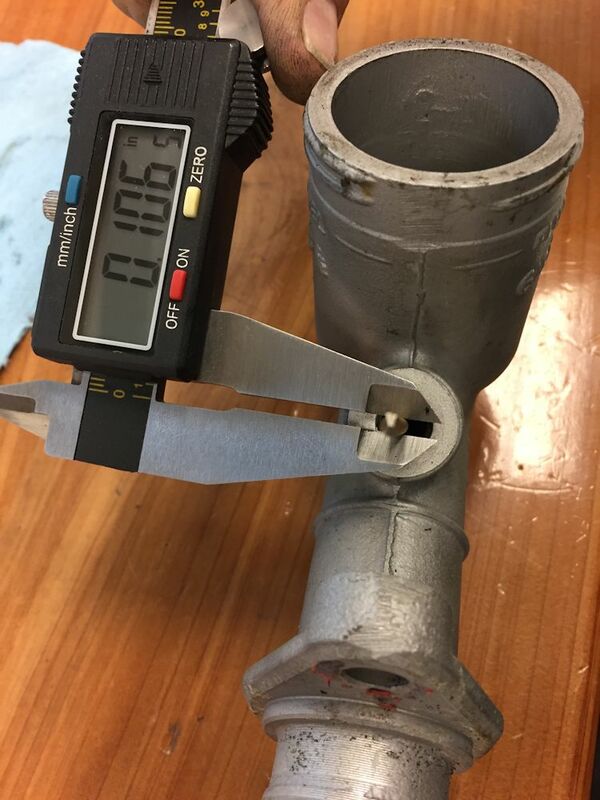 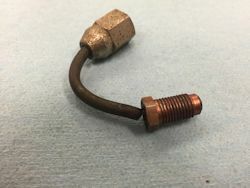 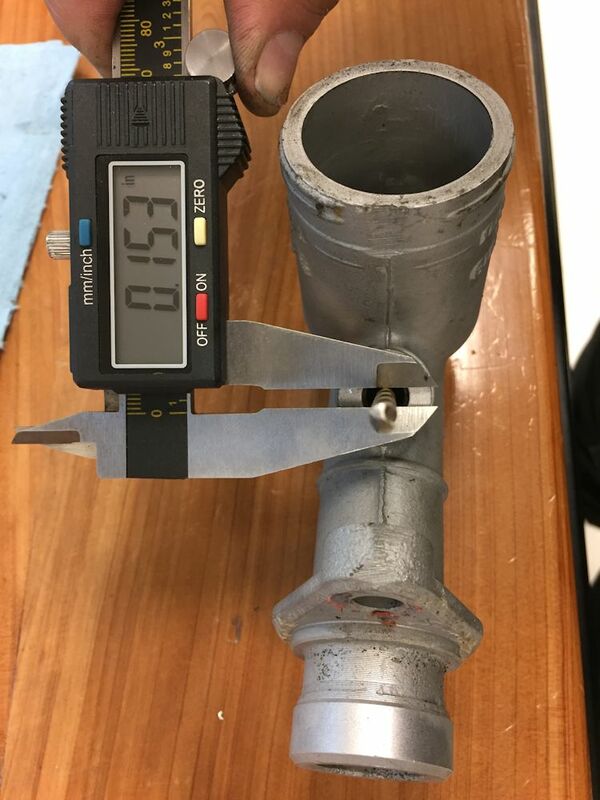 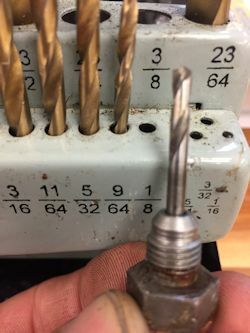 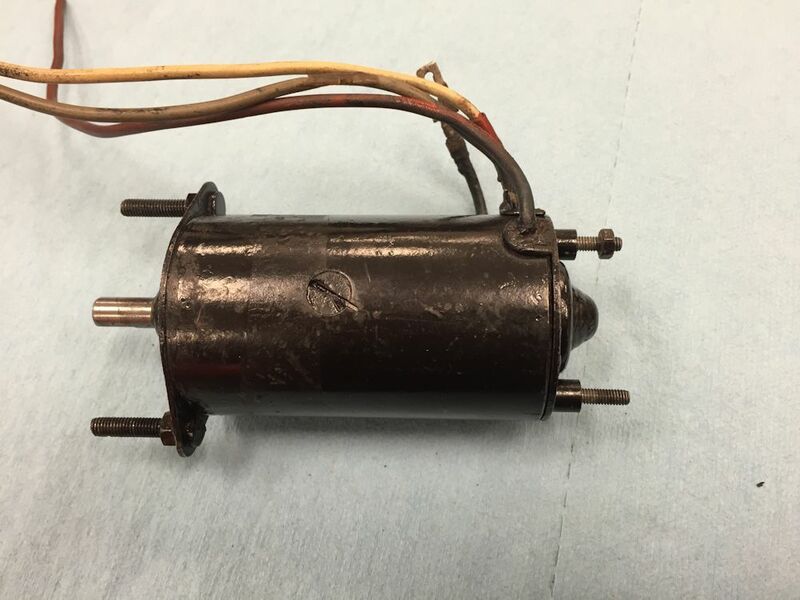 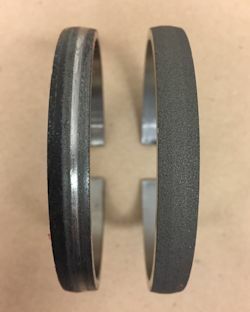 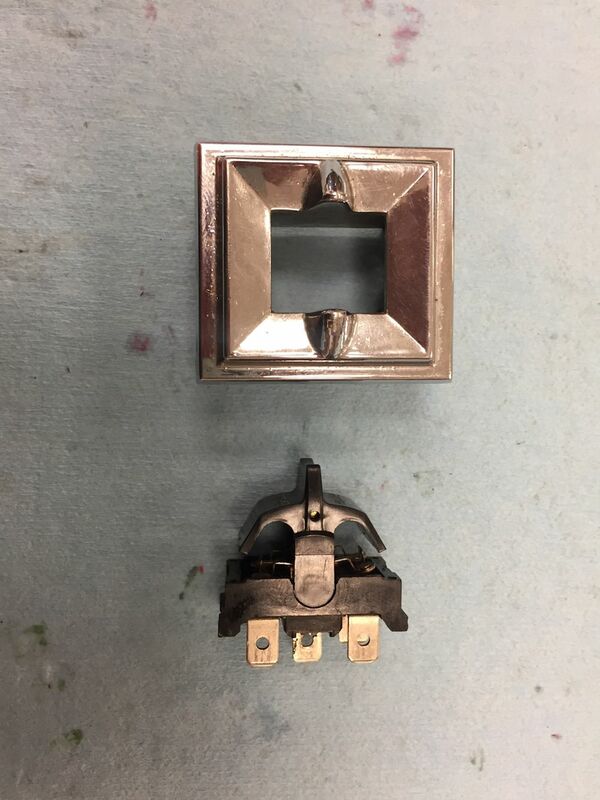 The first problem was that the conduit brackets were held to the cam covers by extremely flimsy little wire clips, all of which had been repaired (soldered) several times in the past. 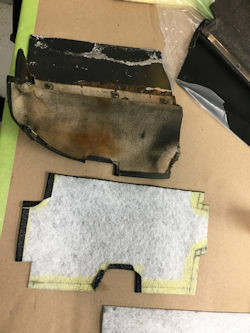 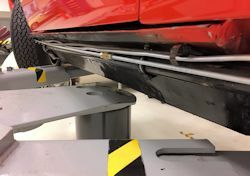 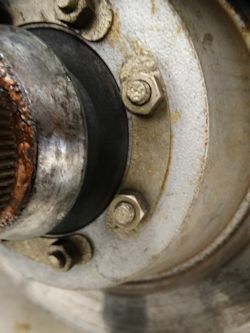 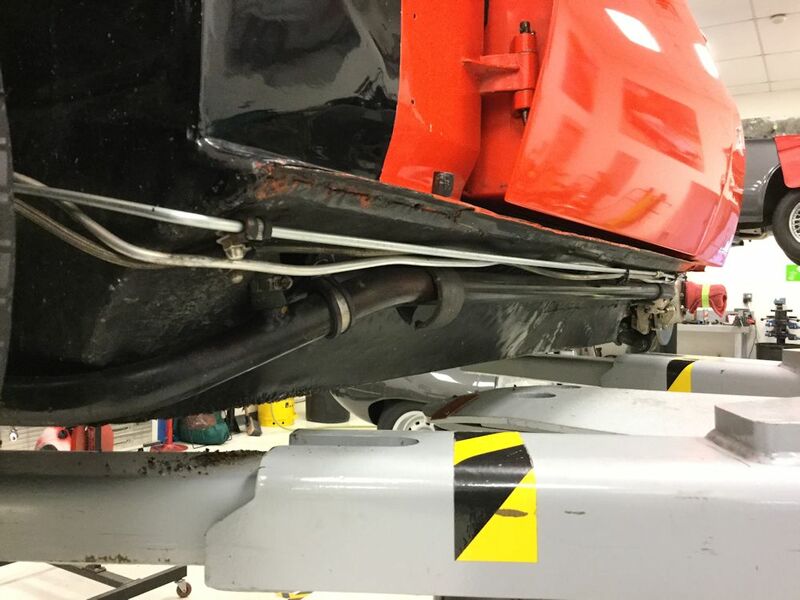 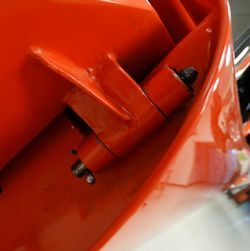 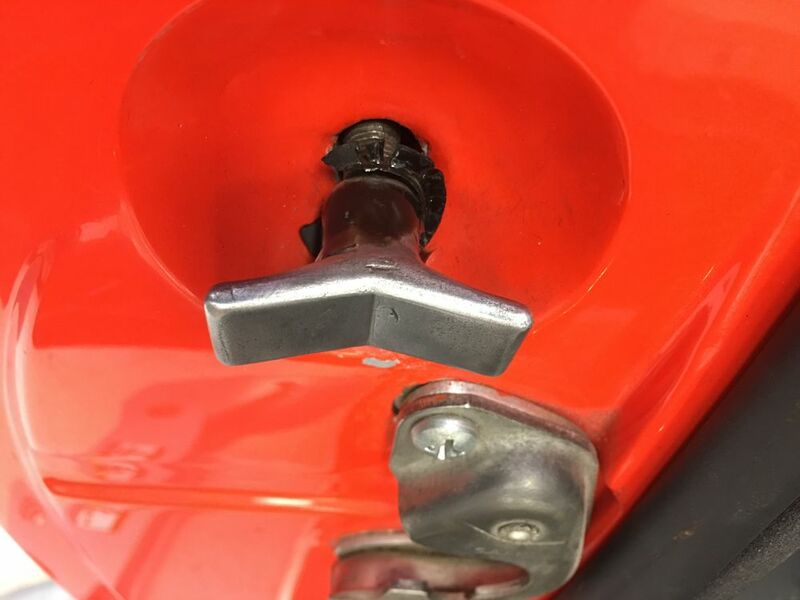 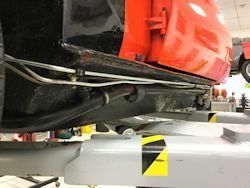 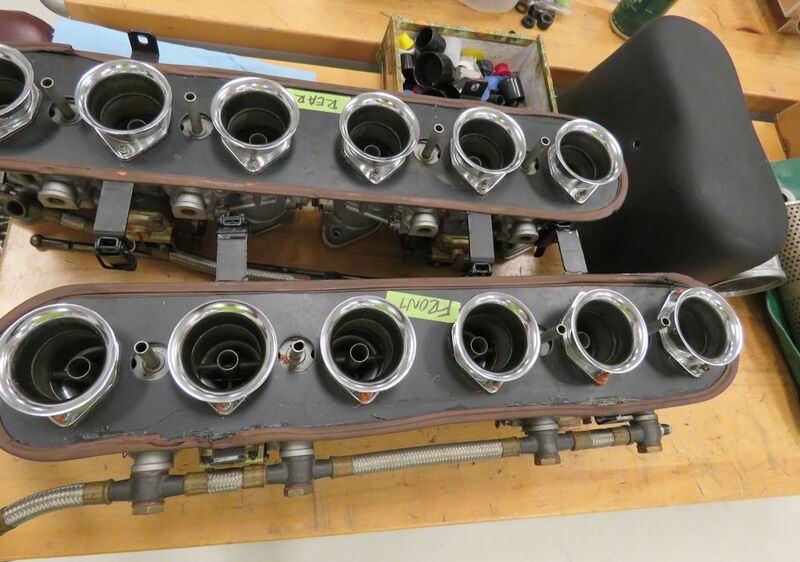 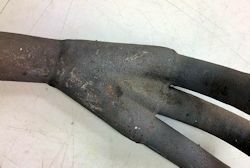 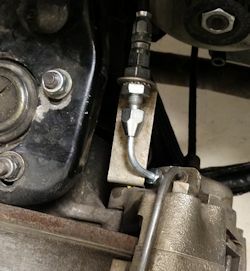 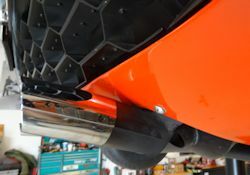 The next issue was that the conduit clips were installed 180 degrees out, meaning the plug wires ran down the center line of the engine, rather than sitting beneath the shields. 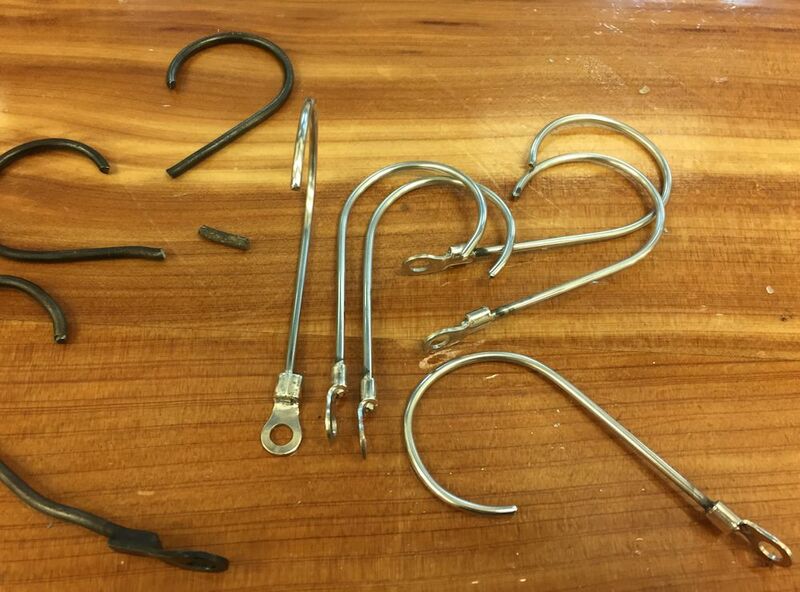 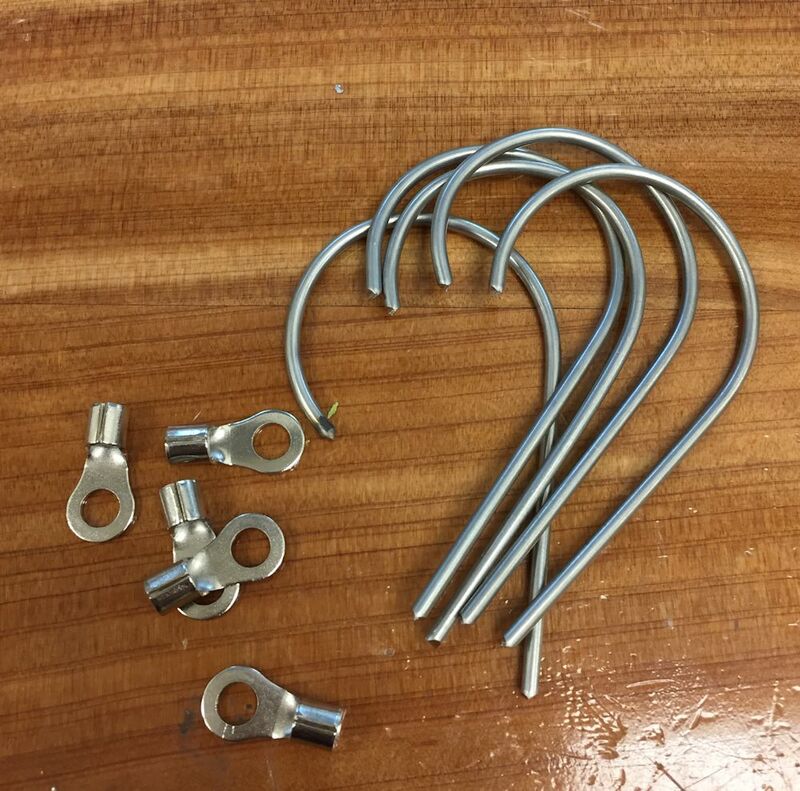 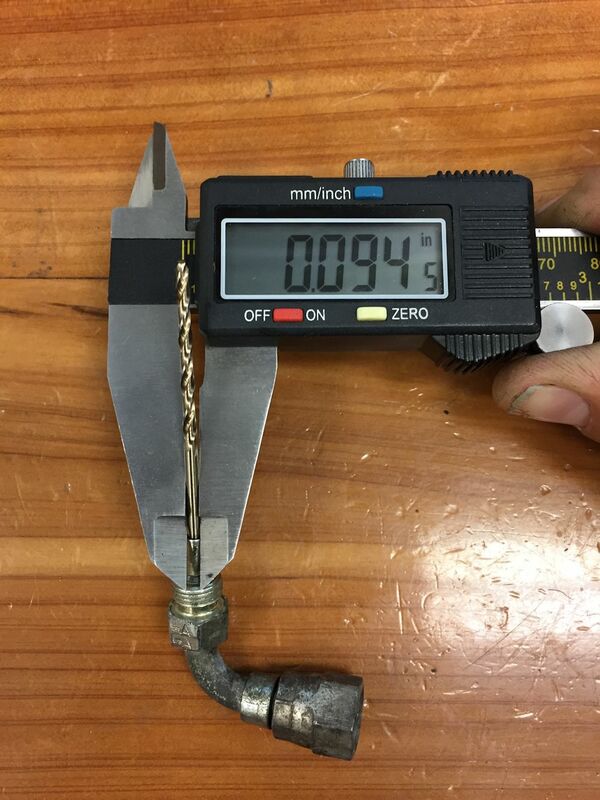 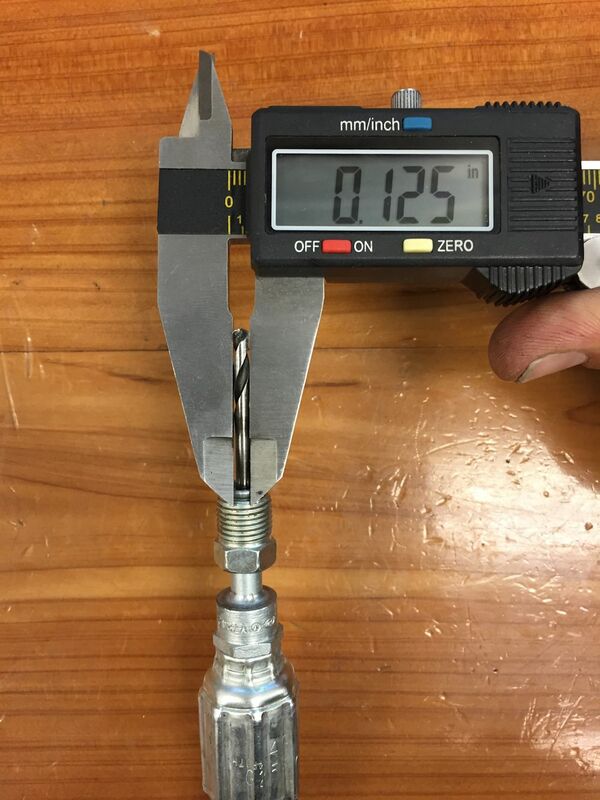 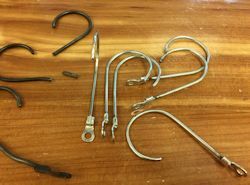 Chris fabricated new conduit clips from stainless steel stock. 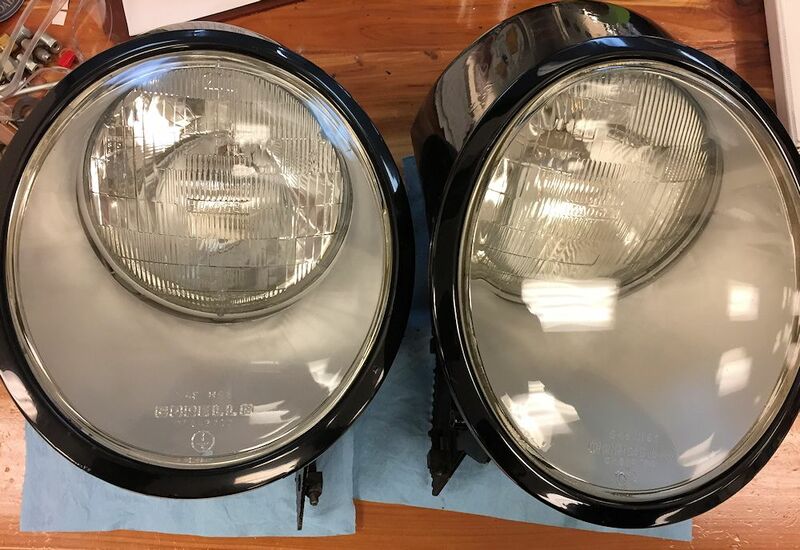 They look almost identical to the originals, but a far sturdier. 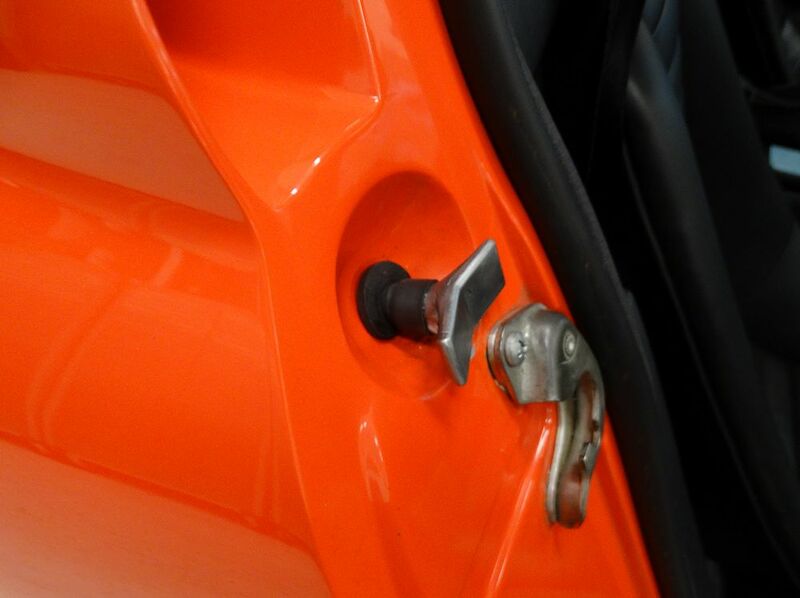 He then installed the new clips so that the plug wires are now protected and hidden by the shields. 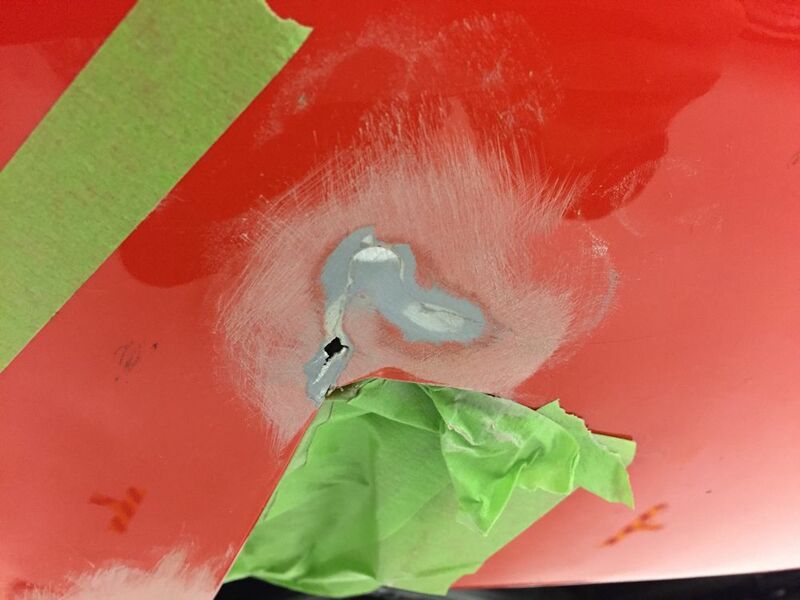 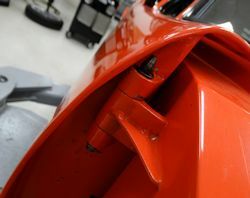 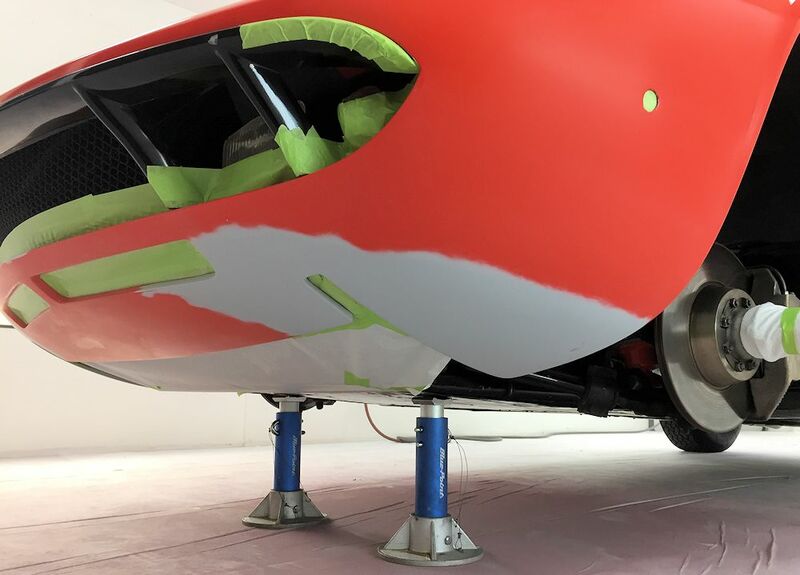 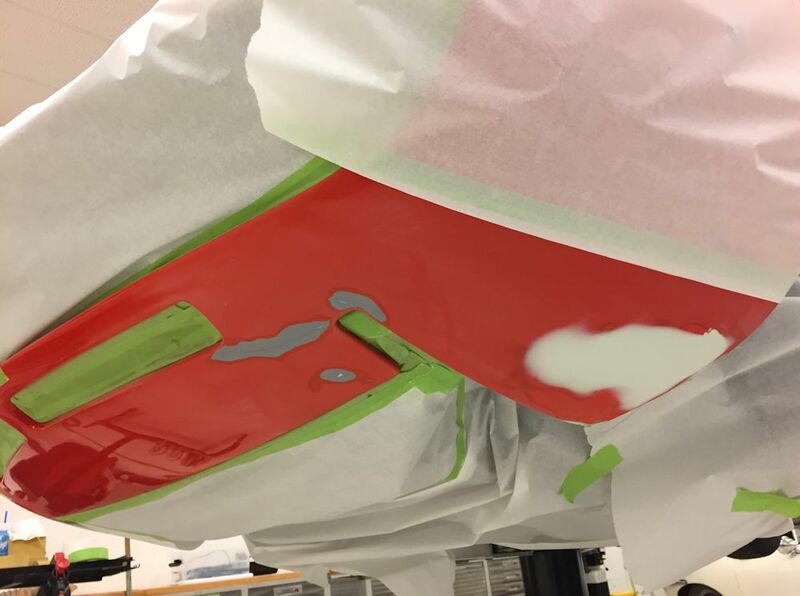 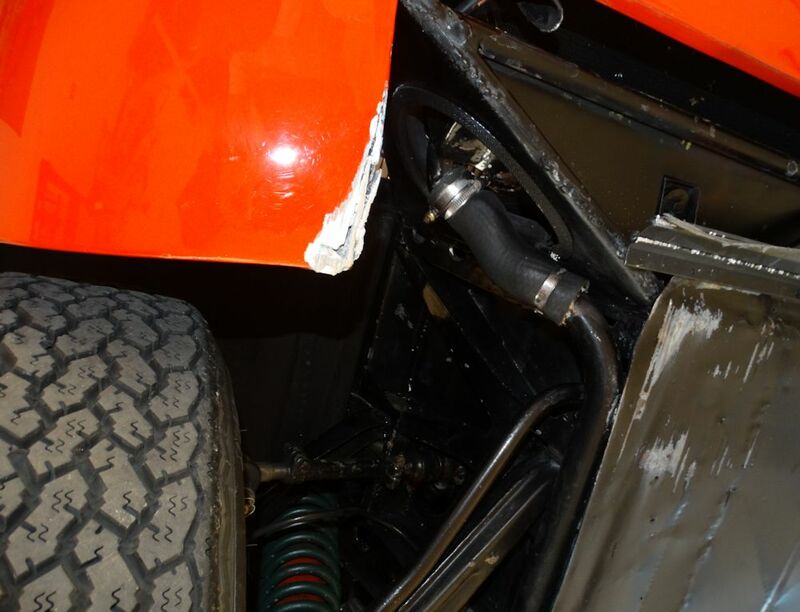 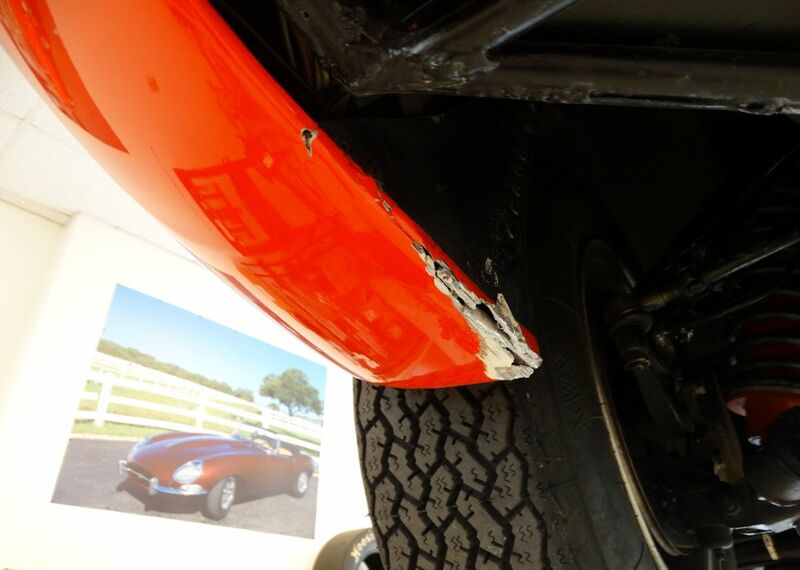 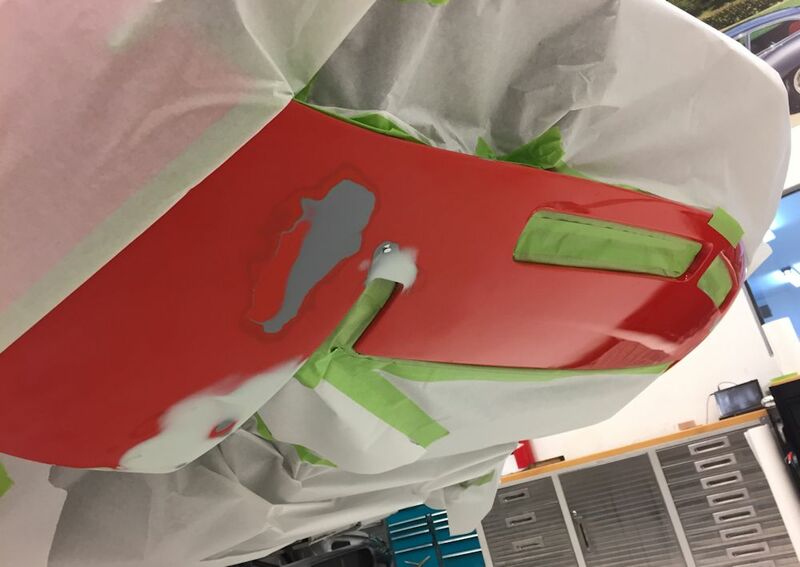 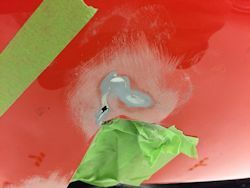 Next task (already underway) is the repair and paintwork of the damaged bodywork beneath the nose of the car. 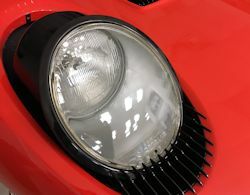 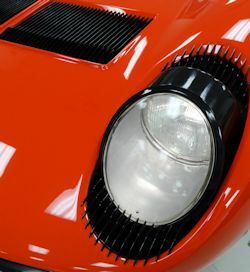 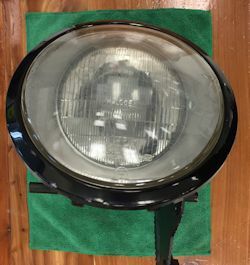 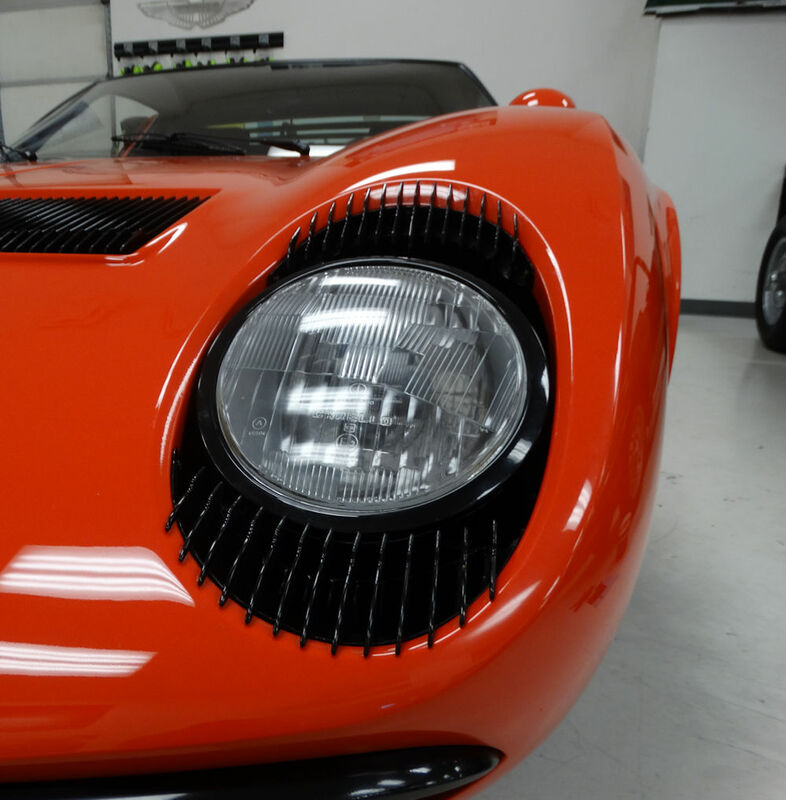 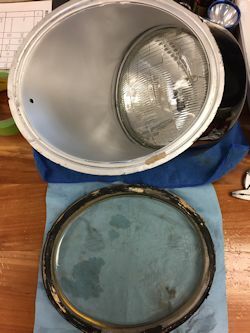 The headlamps on the Miura had recently stopped working and they were also suffering from decades of grime and condensation stains behind the lenses. 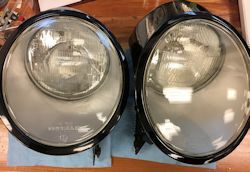 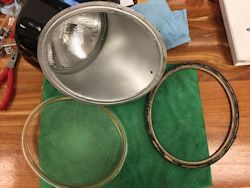 Chris has now removed and disassembled both headlamp assemblies, cleaned all the internals and corrected the electrical issues. 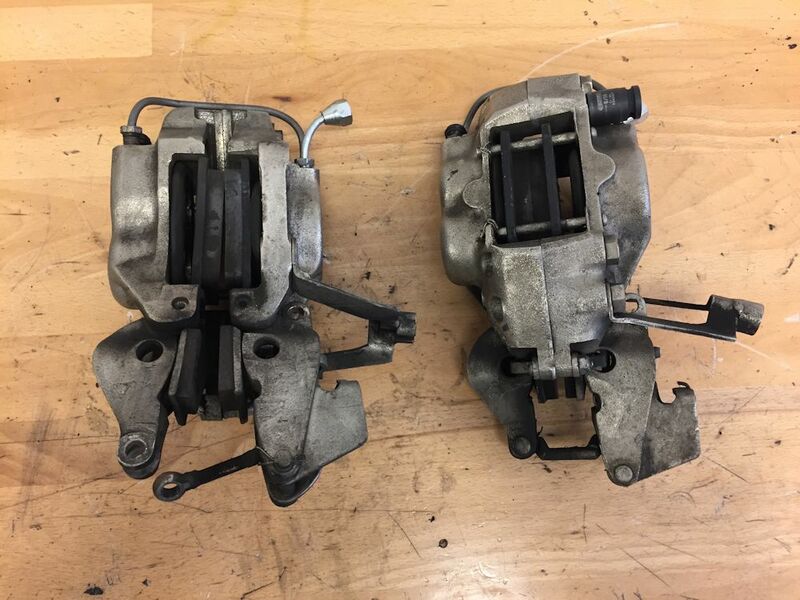 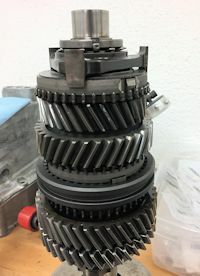 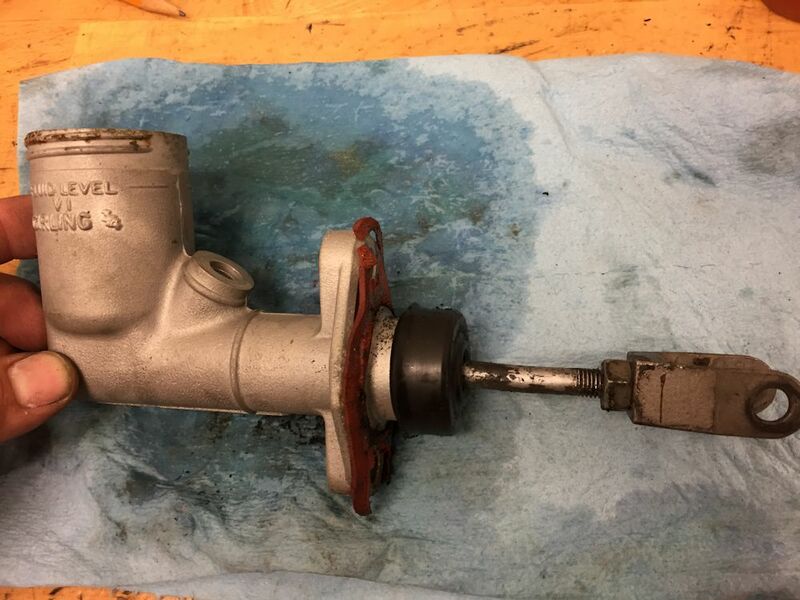 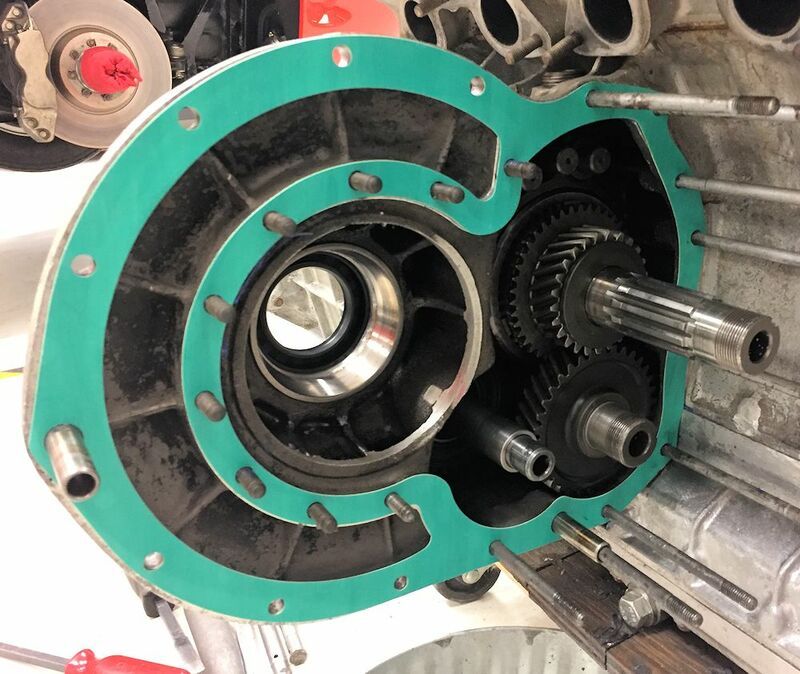 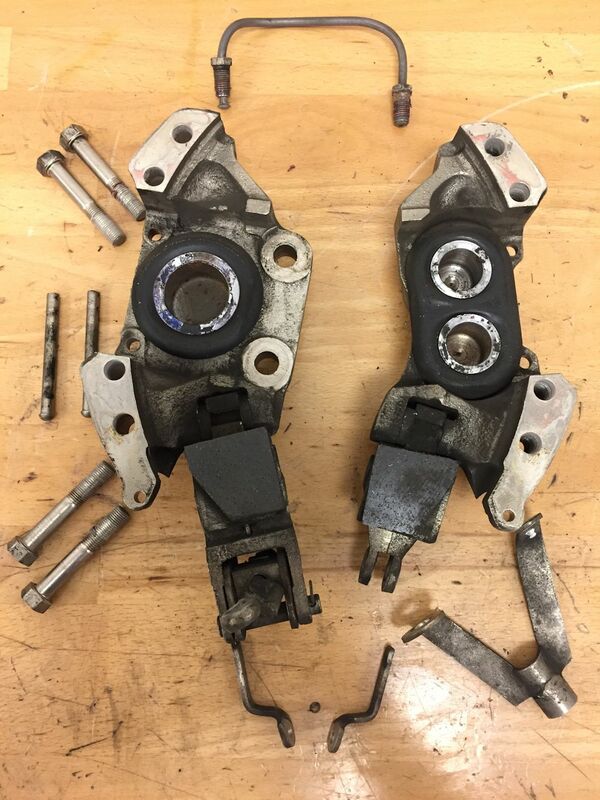 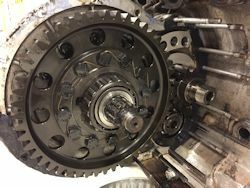 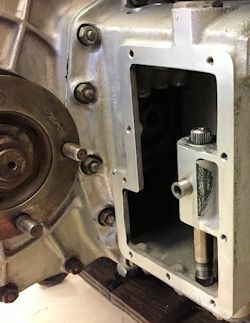 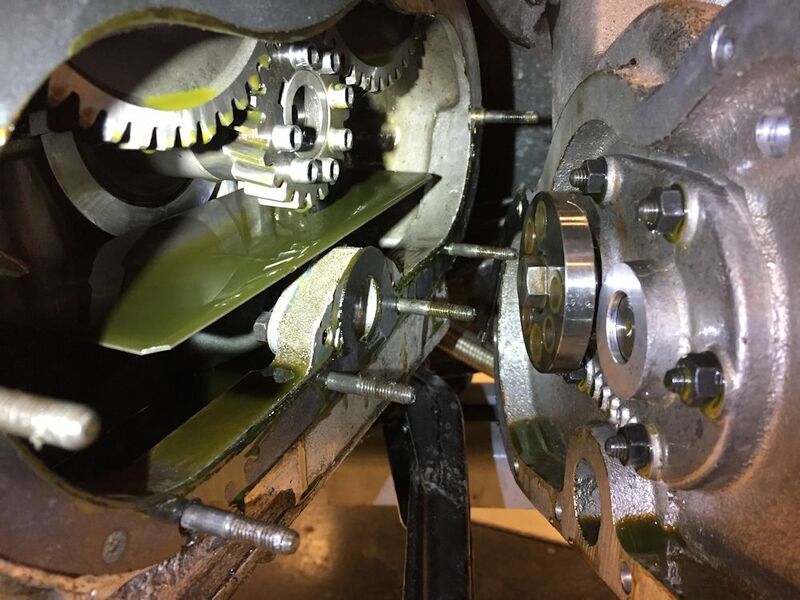 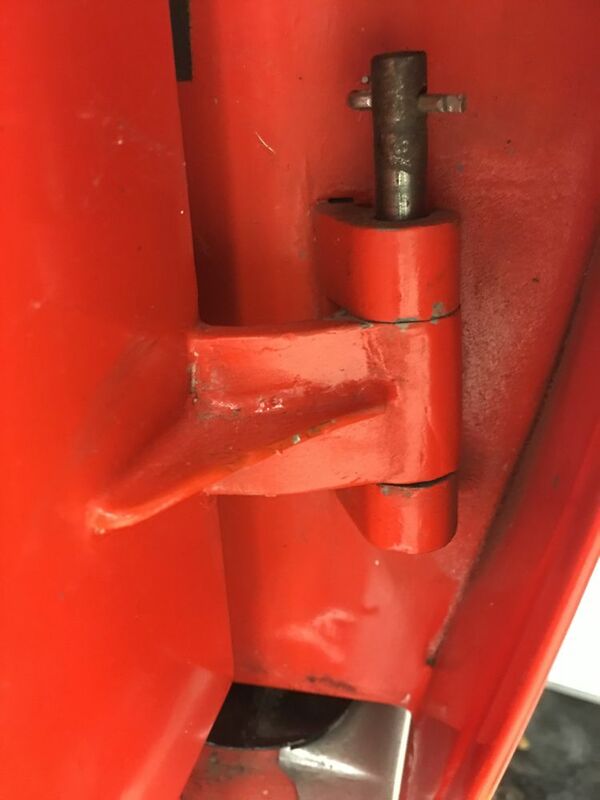 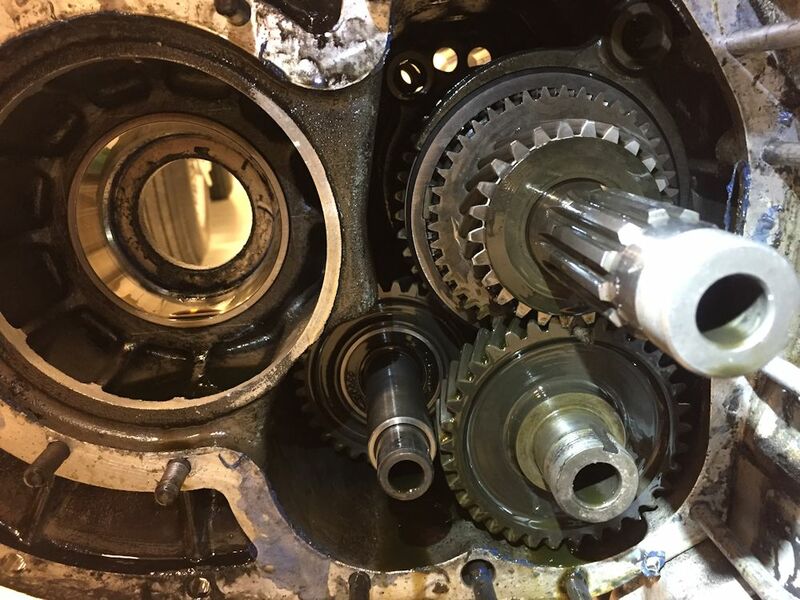 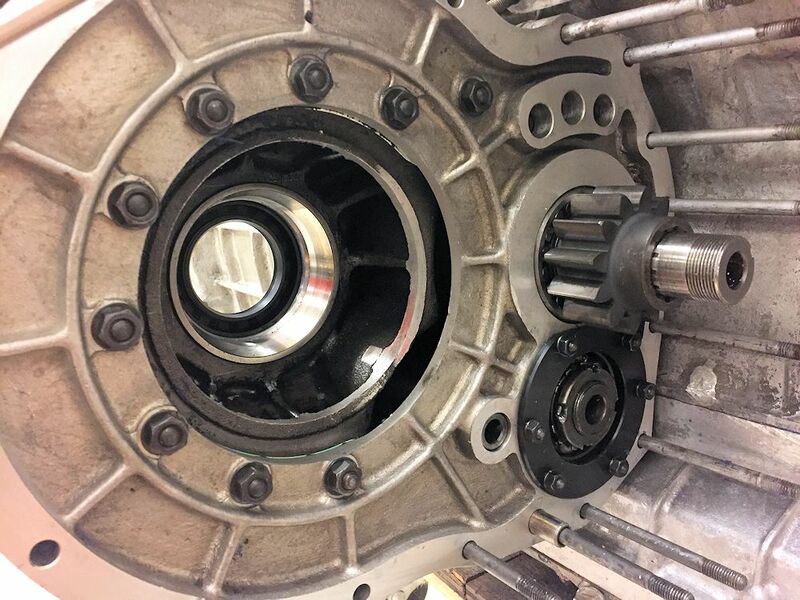 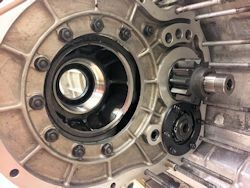 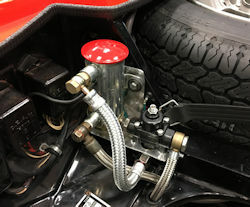 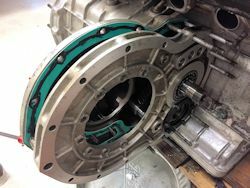 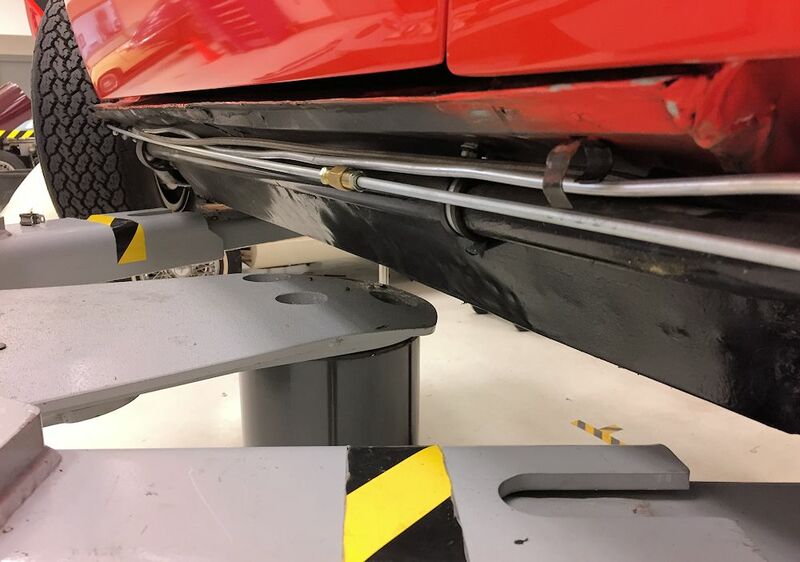 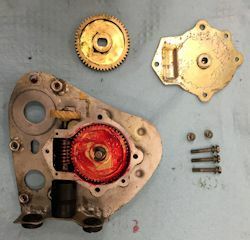 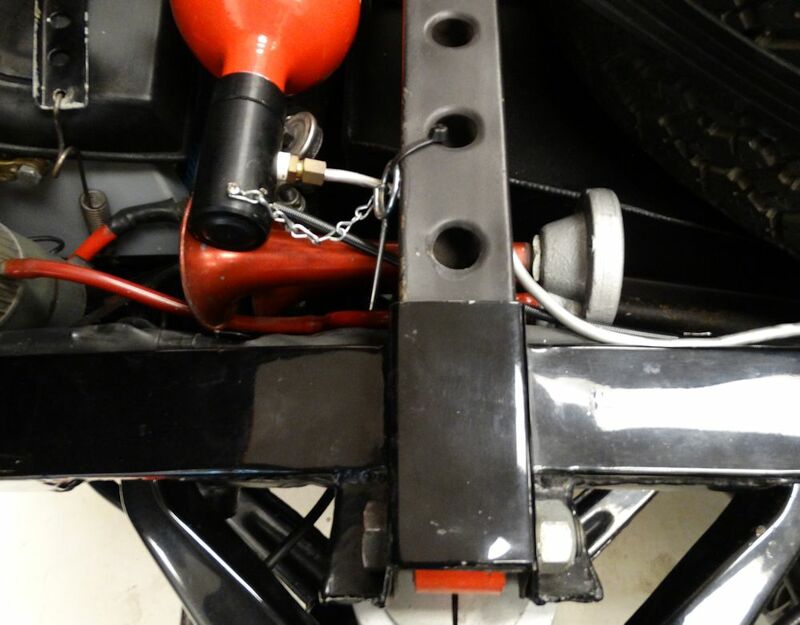 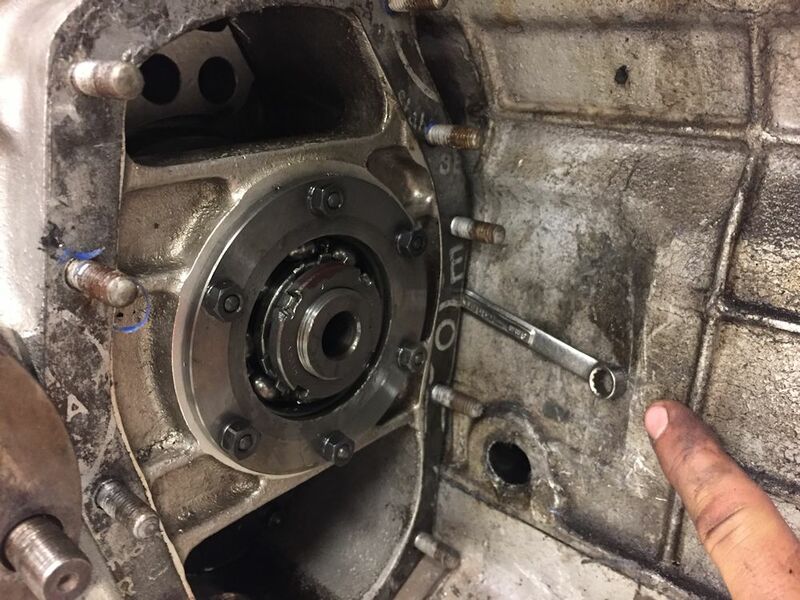 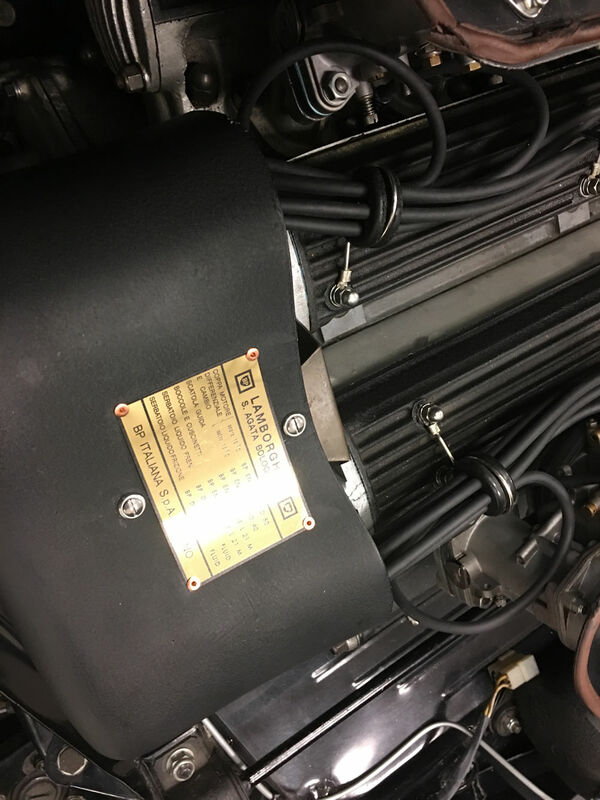 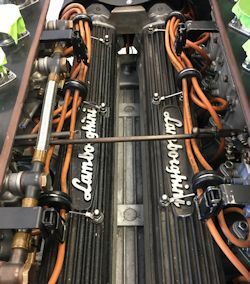 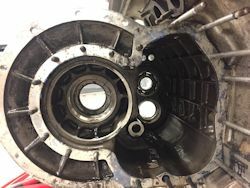 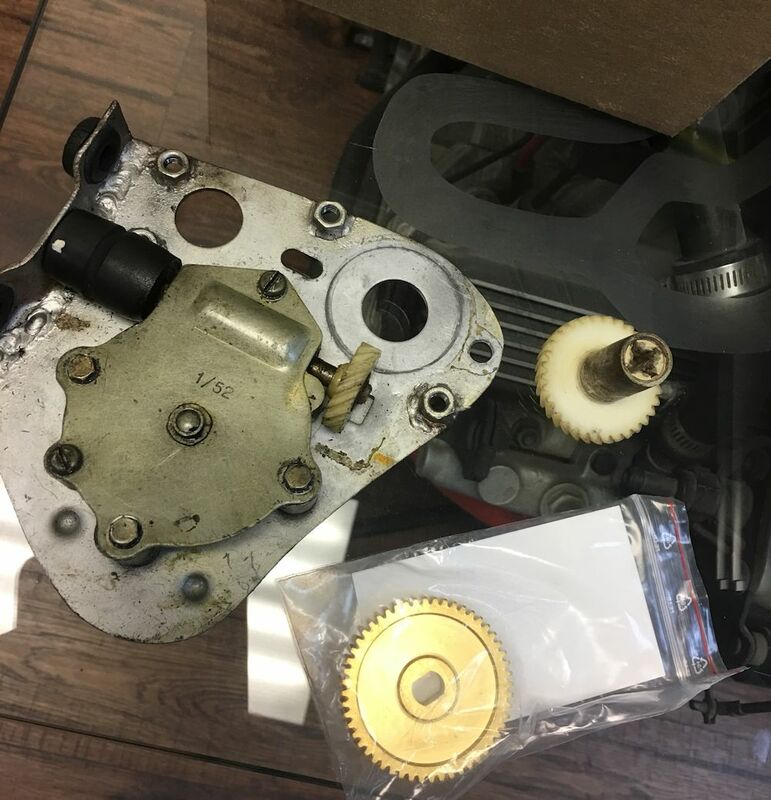 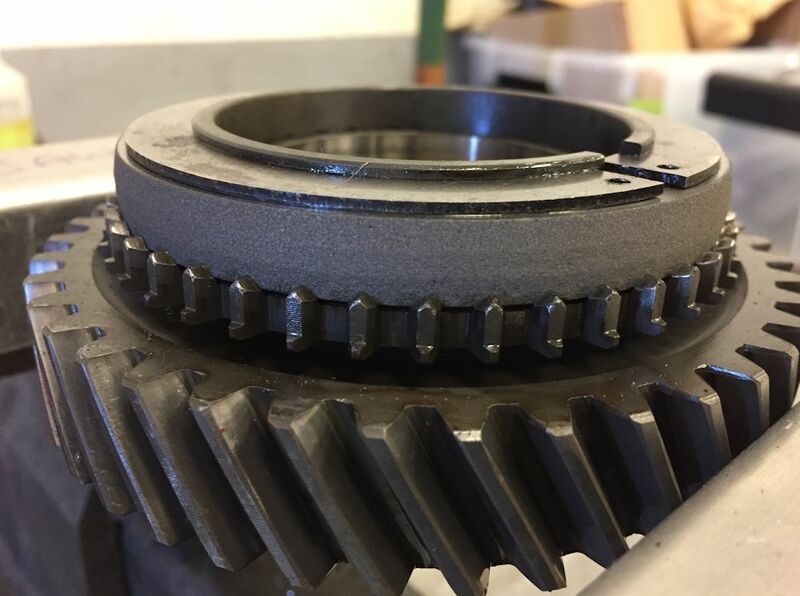 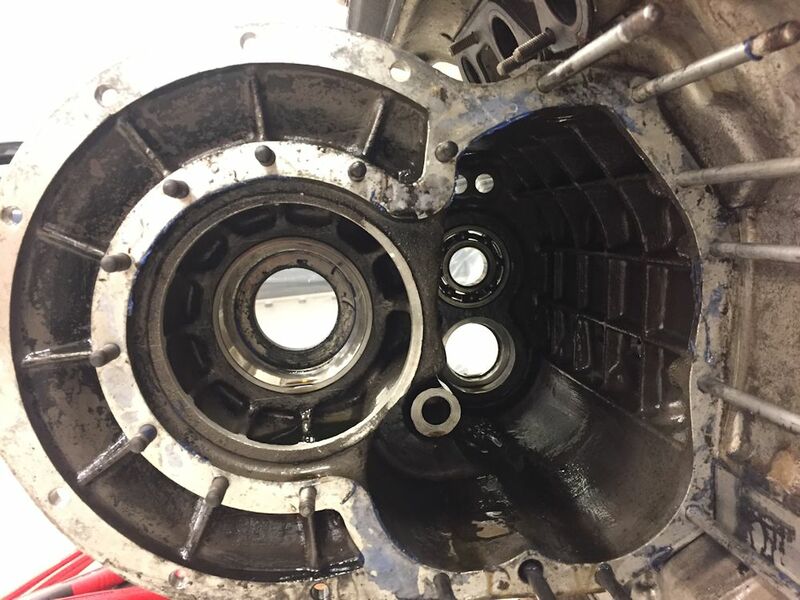 I am pleased to report that we have completed our upgrade of the clutch hydraulic system and the clutch is working perfectly, with a noticeable improvement in pedal feel. Thanks to Valentino Balboni for the recommendation and advice! 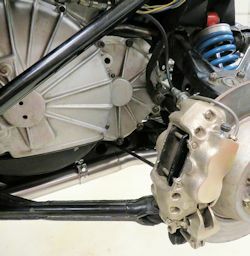 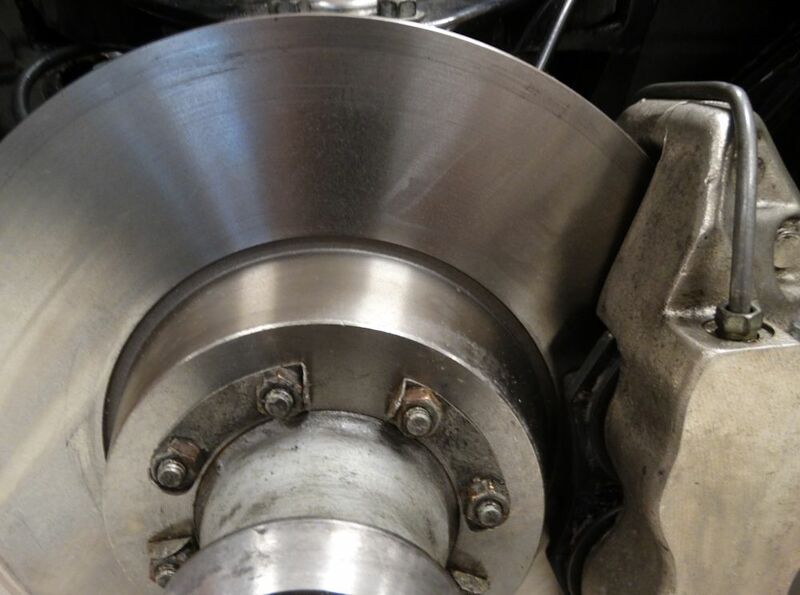 We have already rebuilt the rear brake calipers and installed the new Quick Silver headers and exhaust. 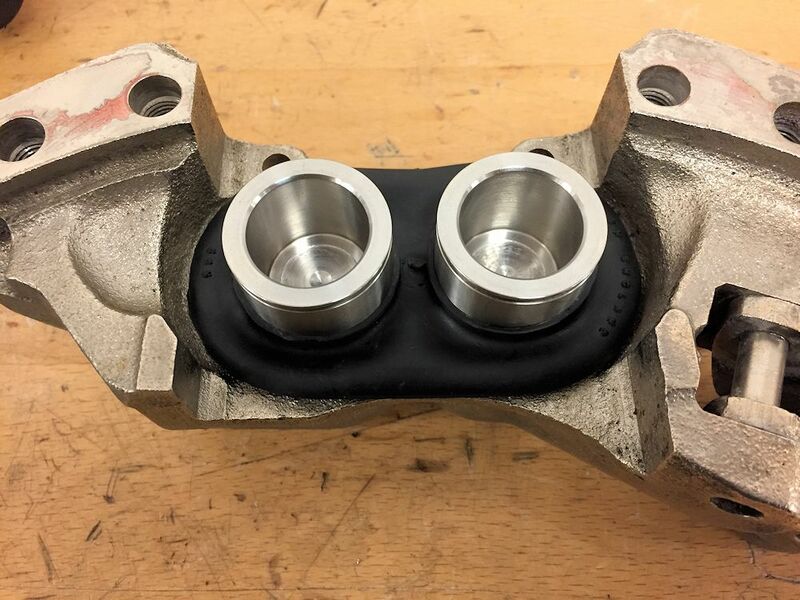 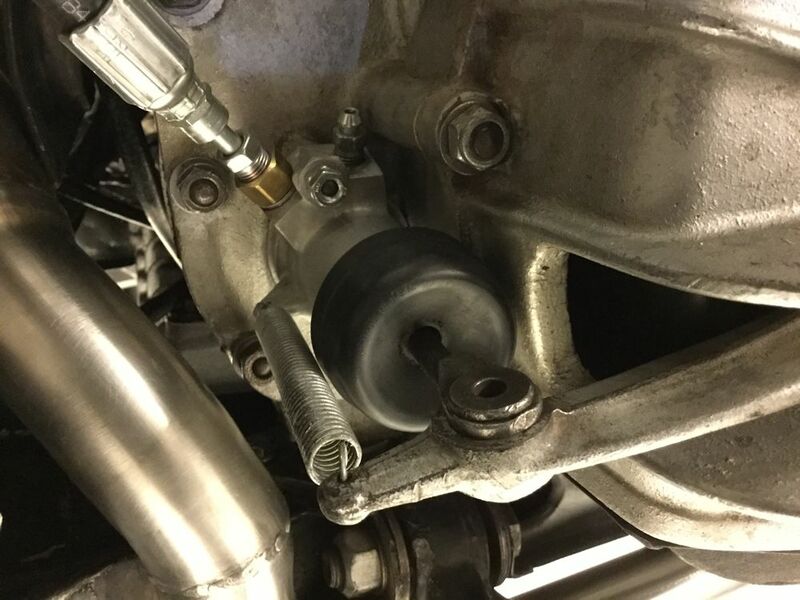 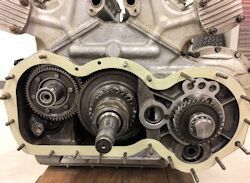 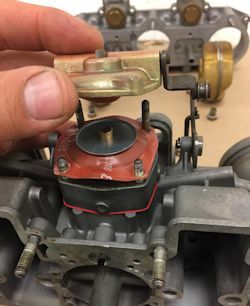 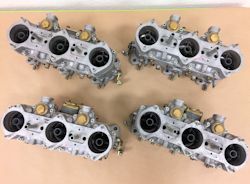 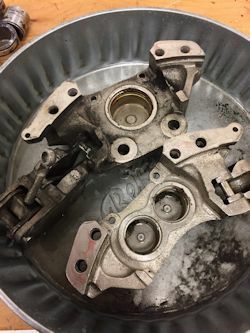 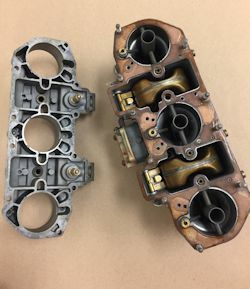 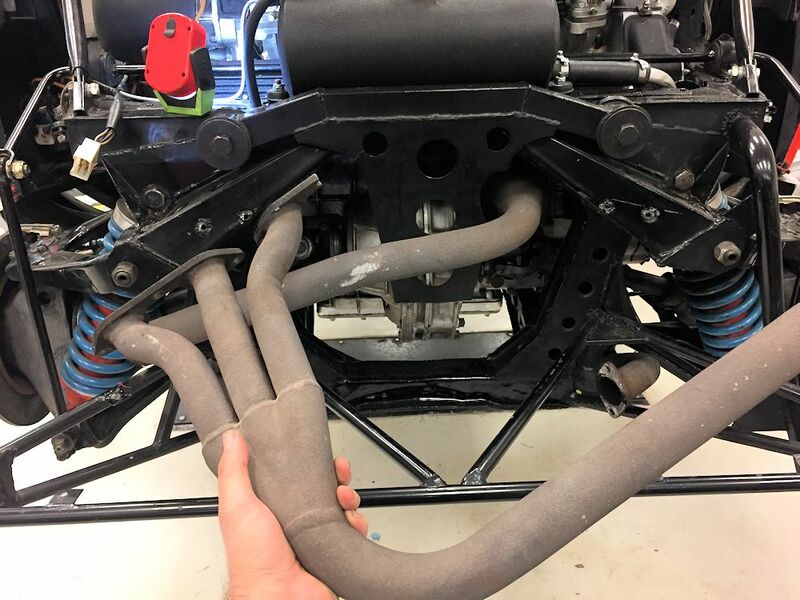 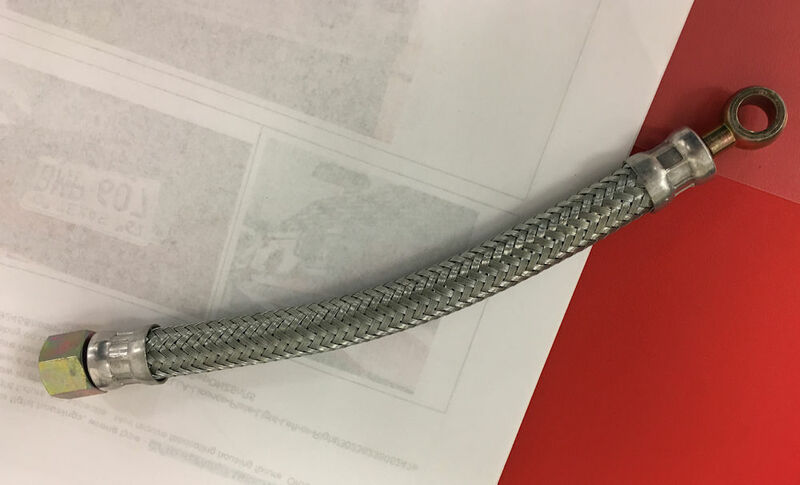 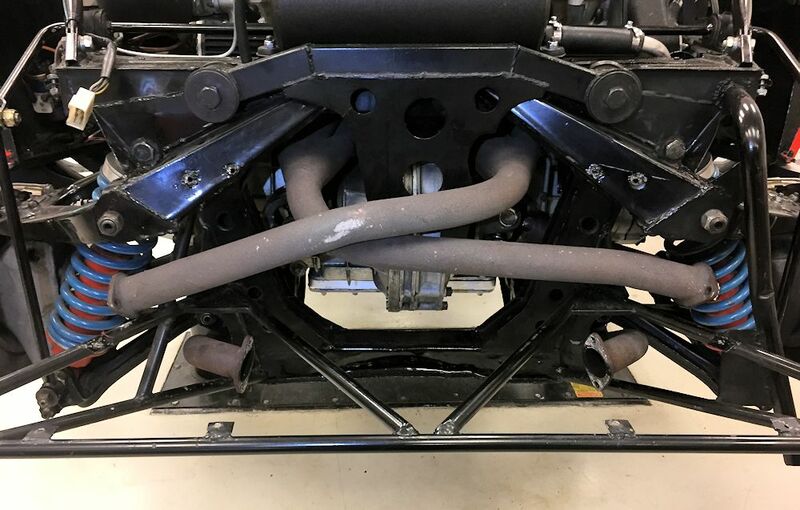 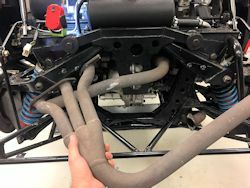 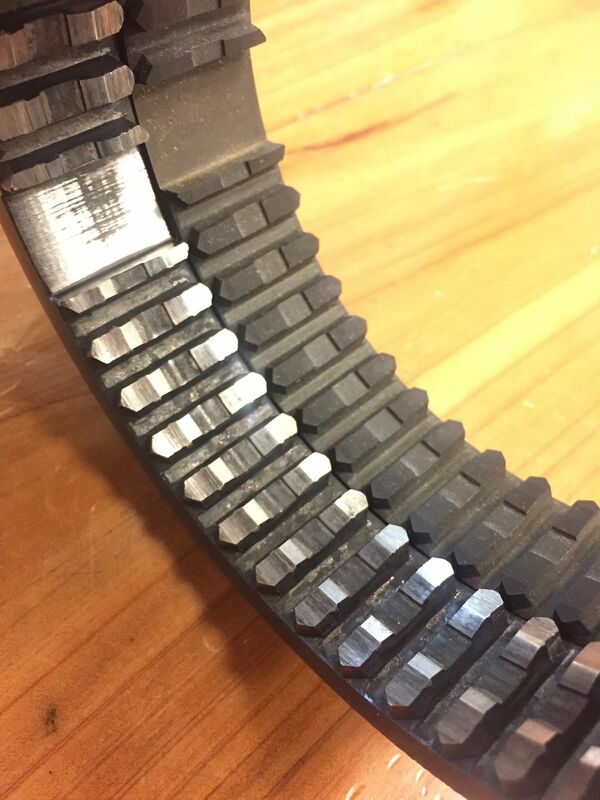 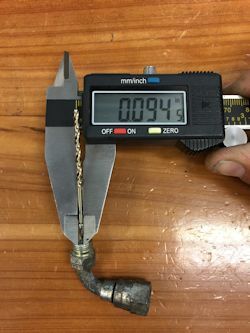 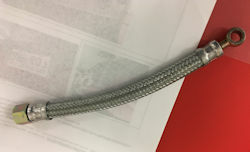 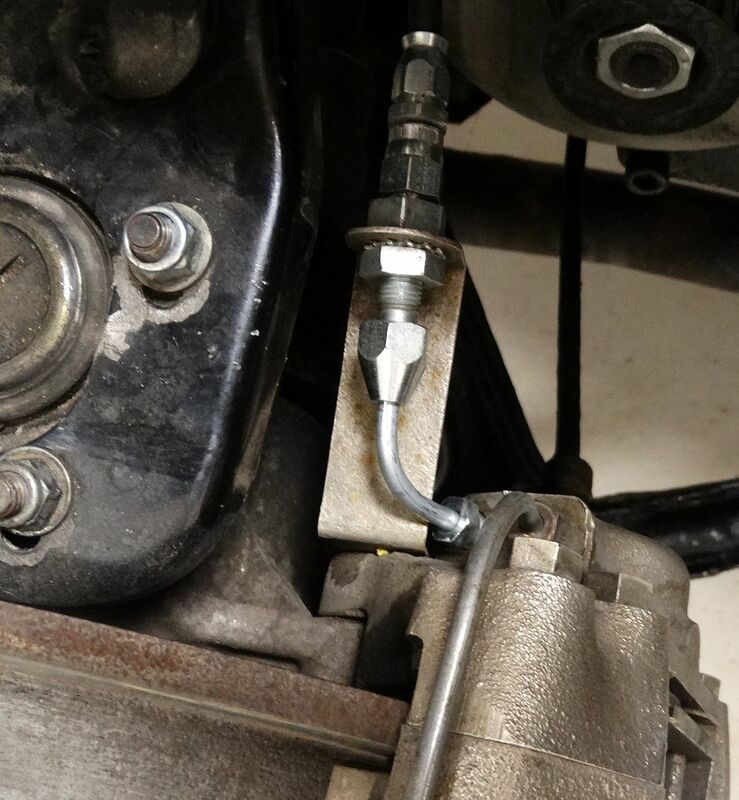 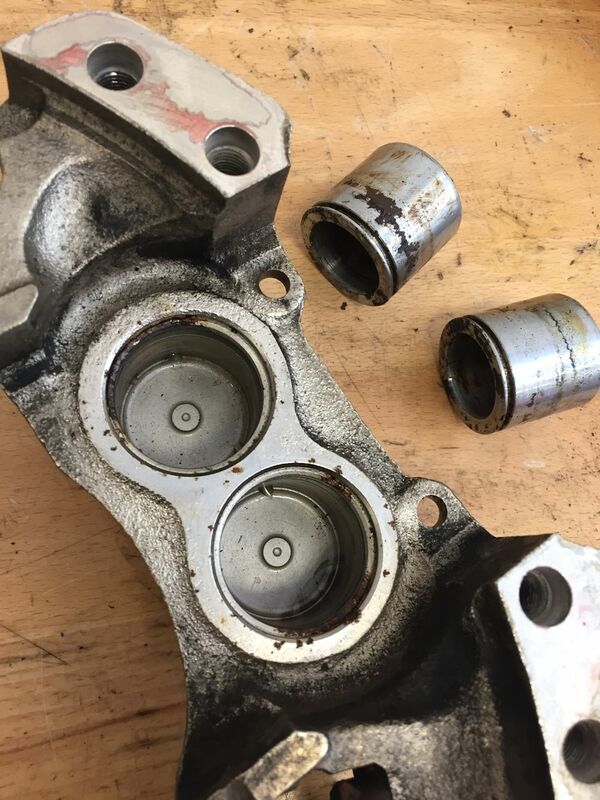 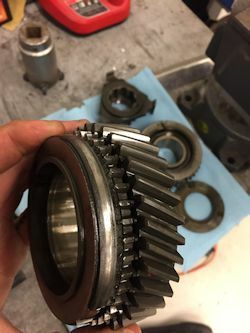 Having investigated the clutch hydraulics, we believe the biggest restriction is in the aftermarket braided clutch line, not the ports of the master and slave cylinders. 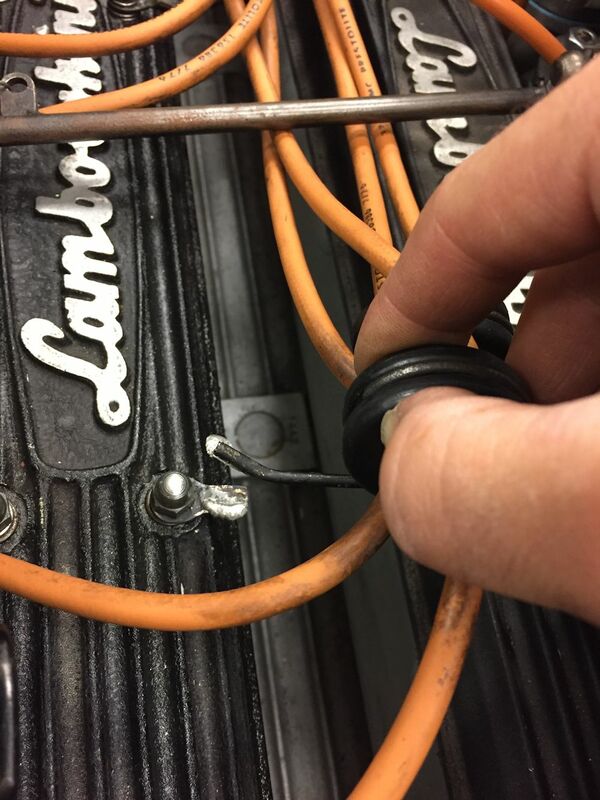 That being the case, we are going to replace the small bore braided line with larger steel line to see if that provides a lighter clutch pedal feel. 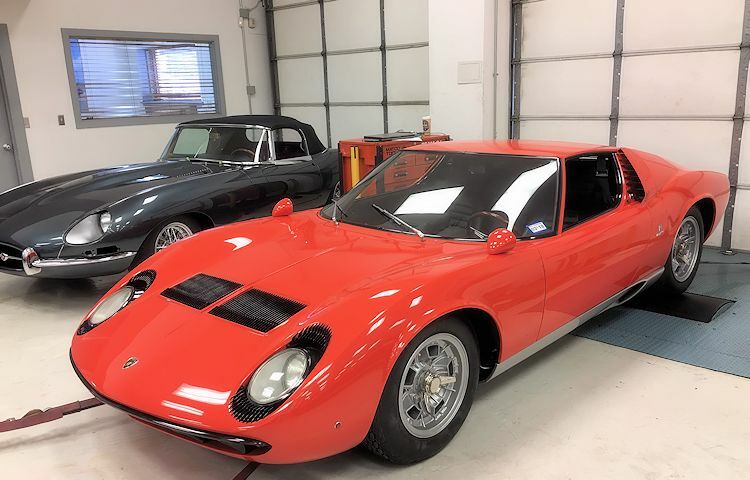 Earlier today legendary Lamborghini factory test driver Valentino Balboni piloted this beautiful Miura for three "aggressive laps" around MSR in Houston. 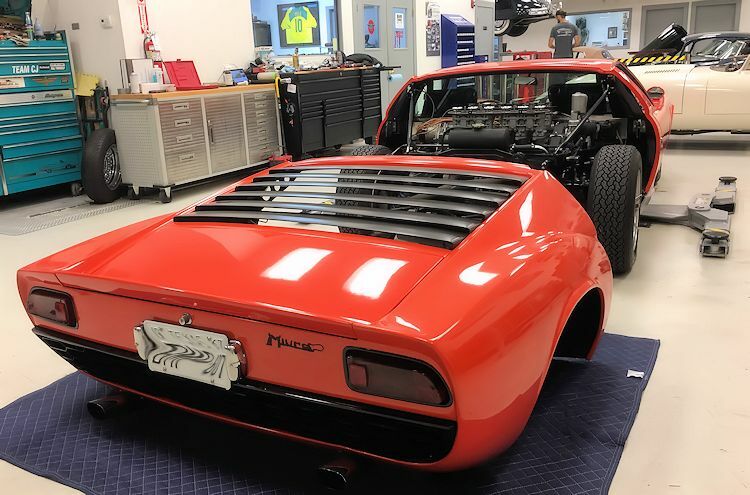 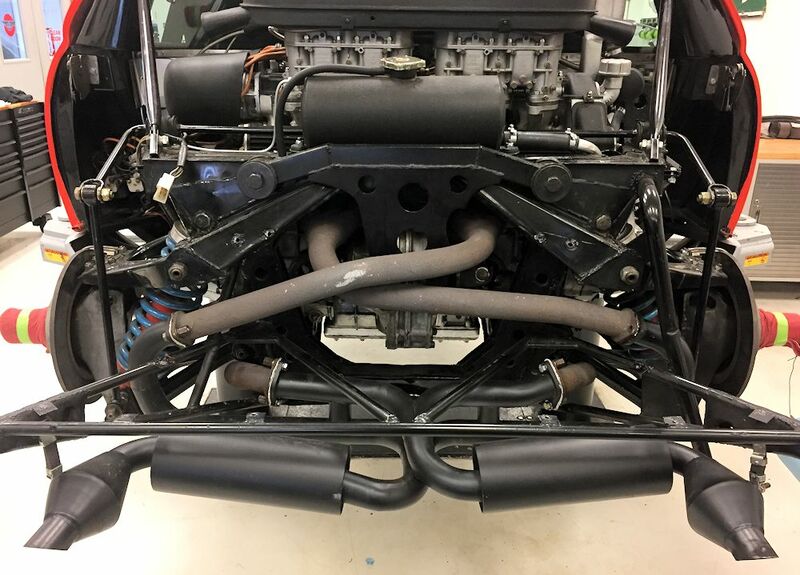 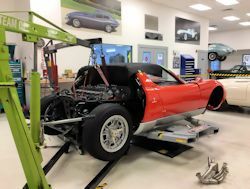 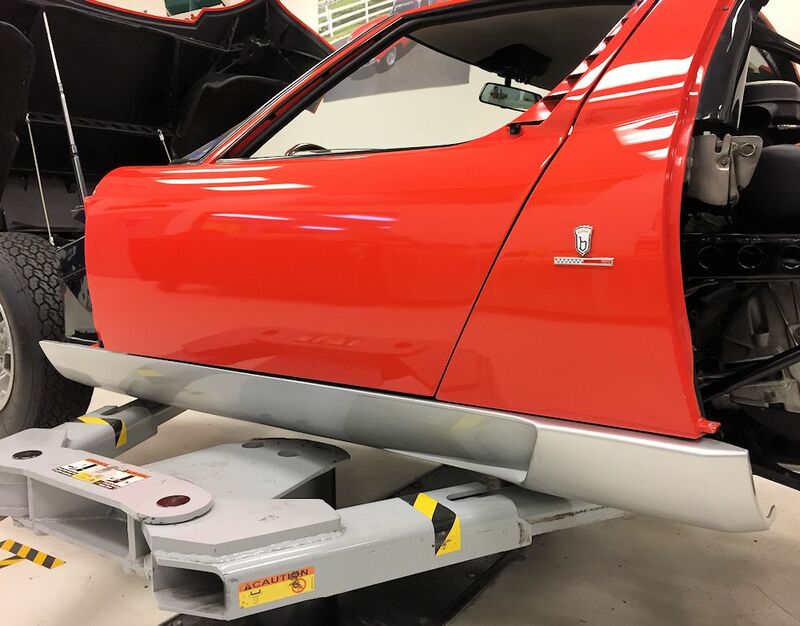 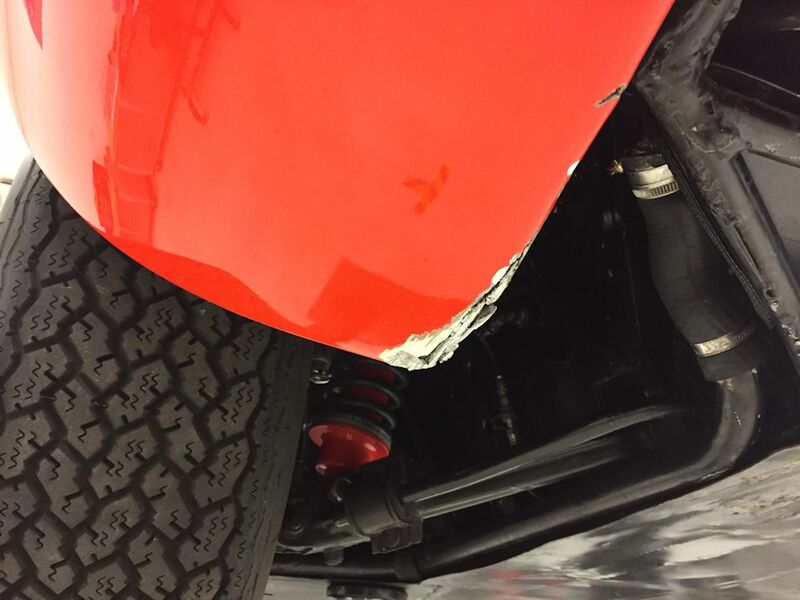 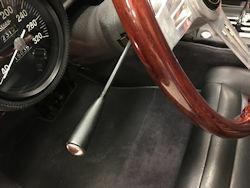 Mr. Balboni had driven the car previously and I am proud to report that he declared our recently completed mechanical work a complete success. 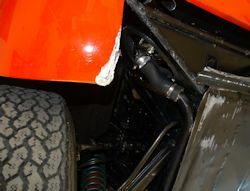 He told the owner of the car, who was a passenger for the laps around MSR, "It is like a different car...better than expected." 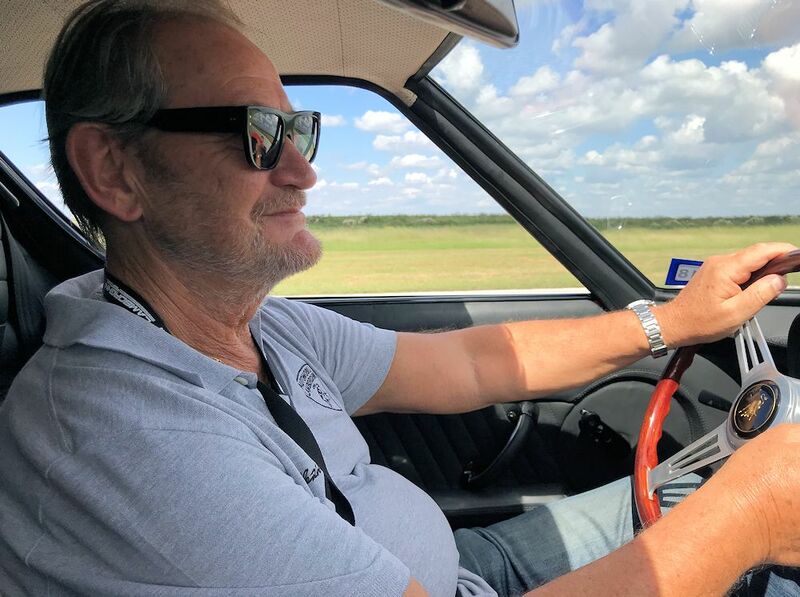 Click on the photo below for a short video clip of the legend behind the wheel. 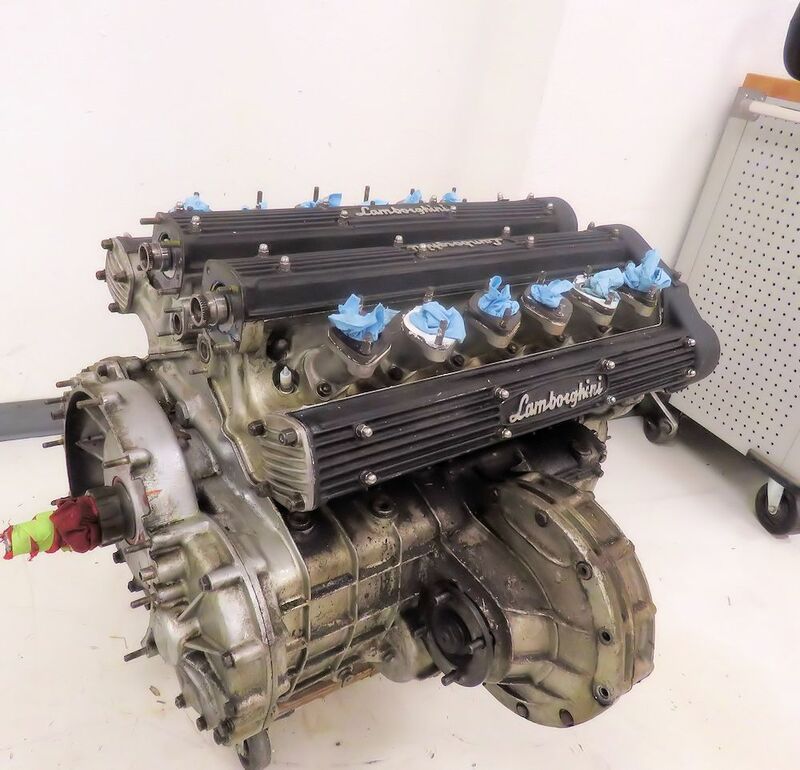 I am pleased to report that we have now completed the transmission rebuild and been busy tuning the rebuilt Webers on the Dyno. 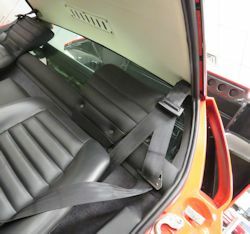 Earlier today I took the car out for some initial road testing, which went very well. 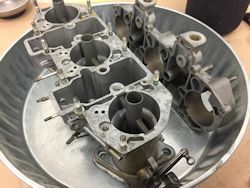 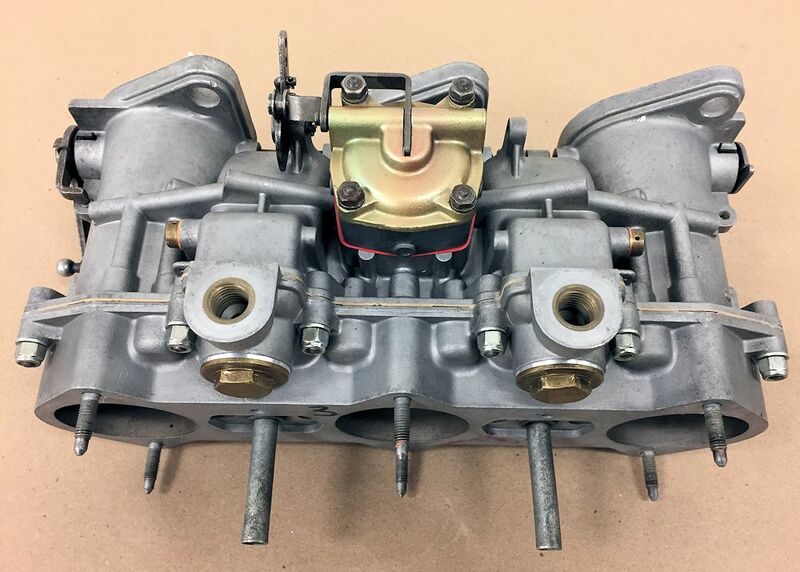 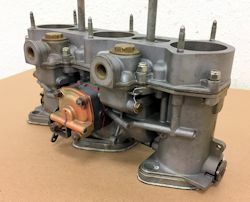 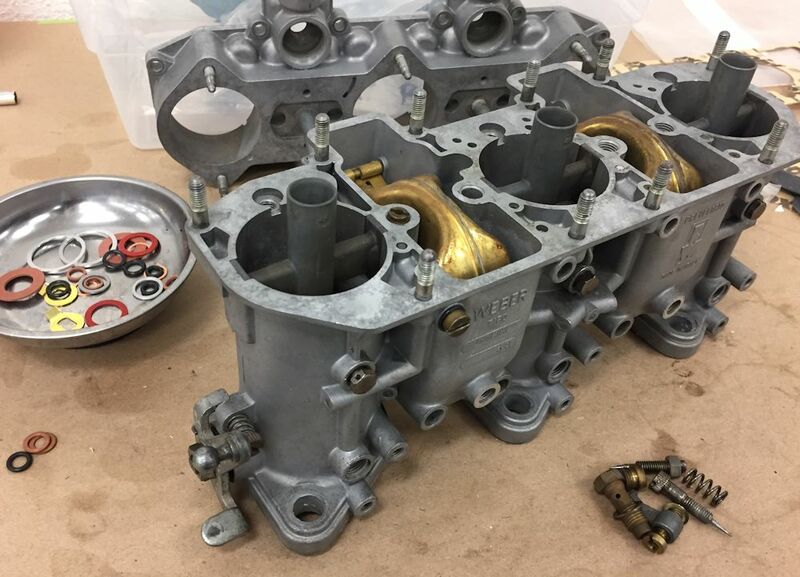 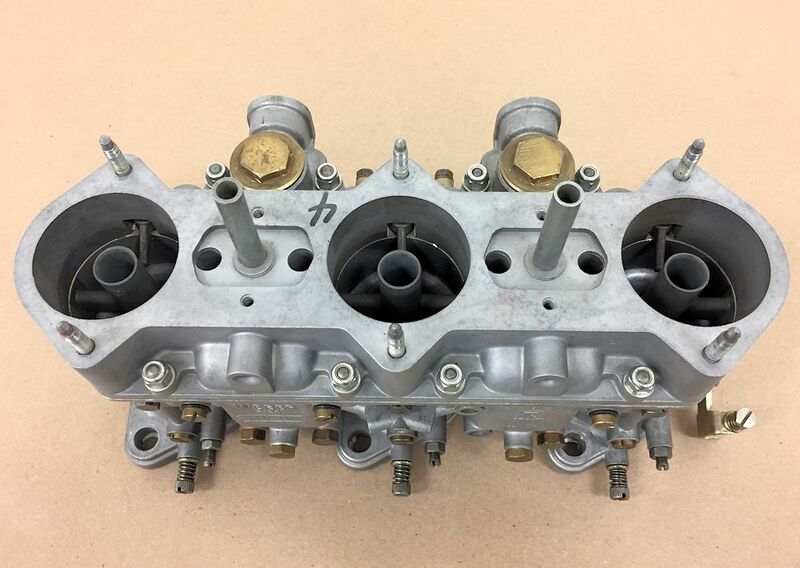 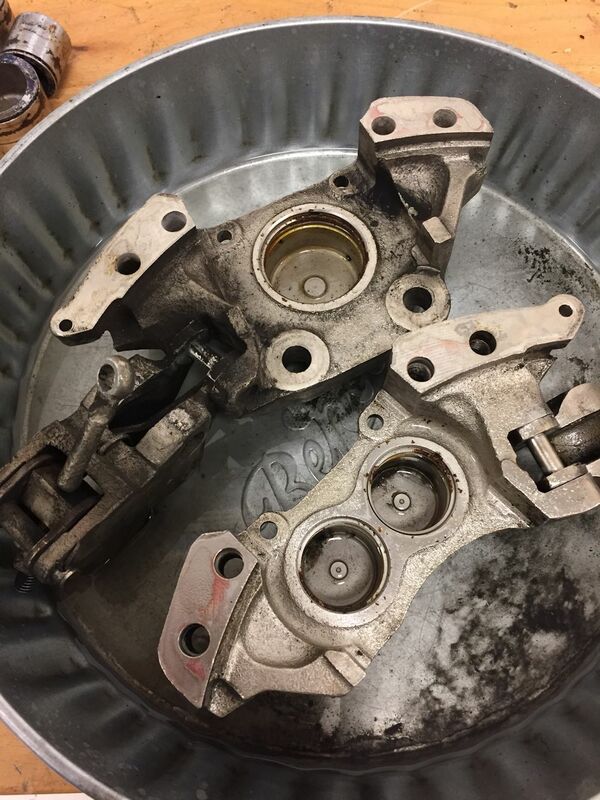 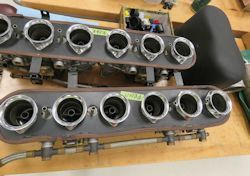 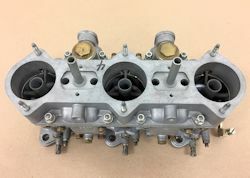 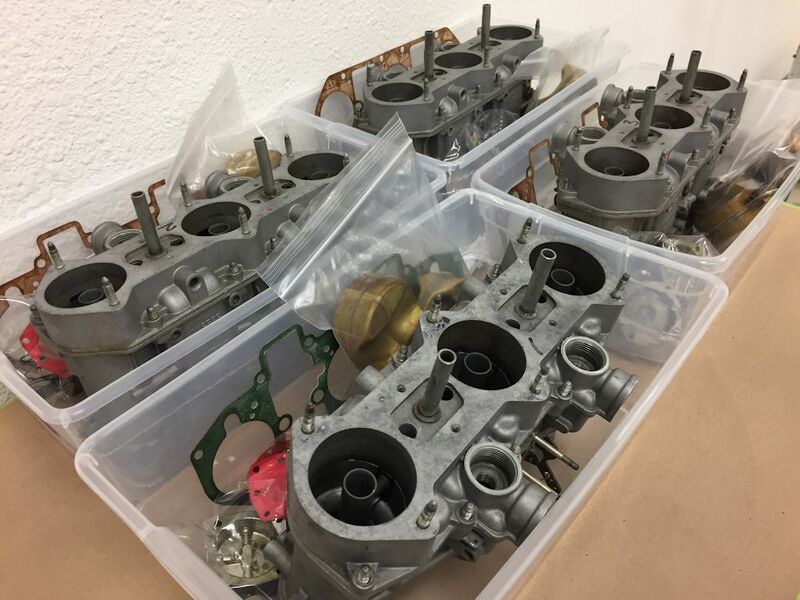 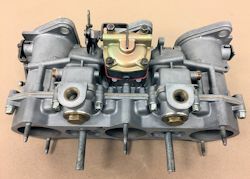 We have now completely rebuilt the Weber carbs and will be wrapping up the transmission rebuild in the next couple of days. 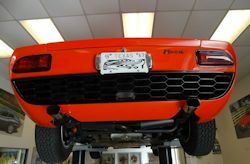 We are on schedule to reinstall the engine and transmission on Wednesday of next week. 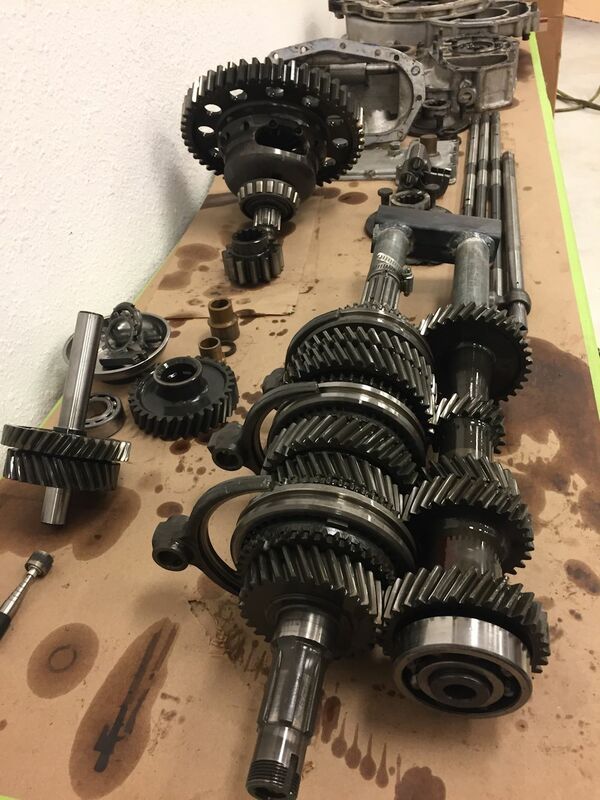 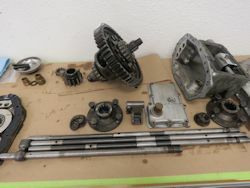 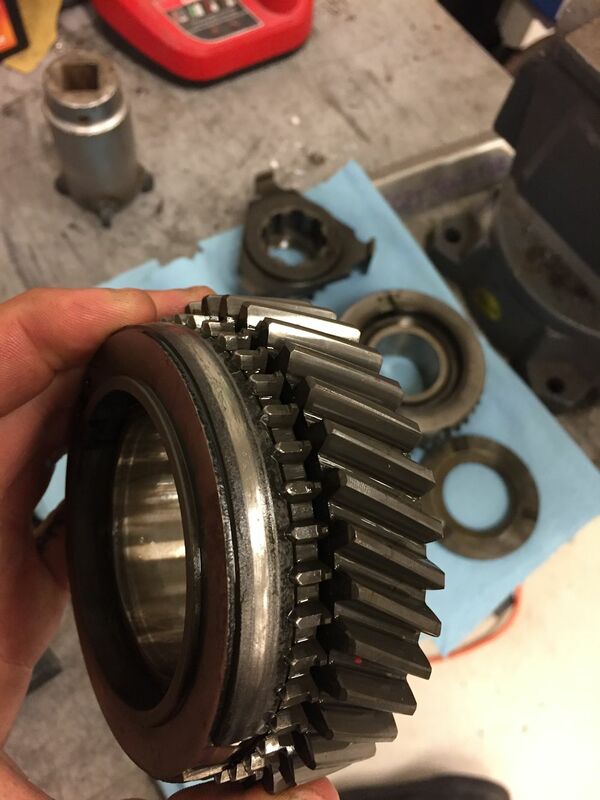 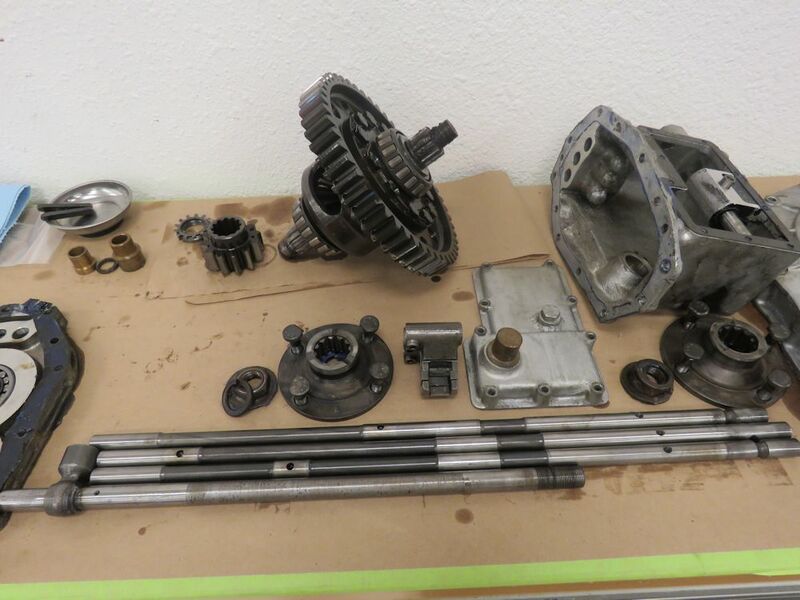 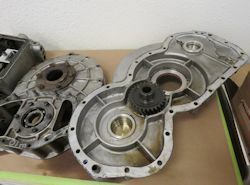 Removing and disassembling the transmission for rebuild. 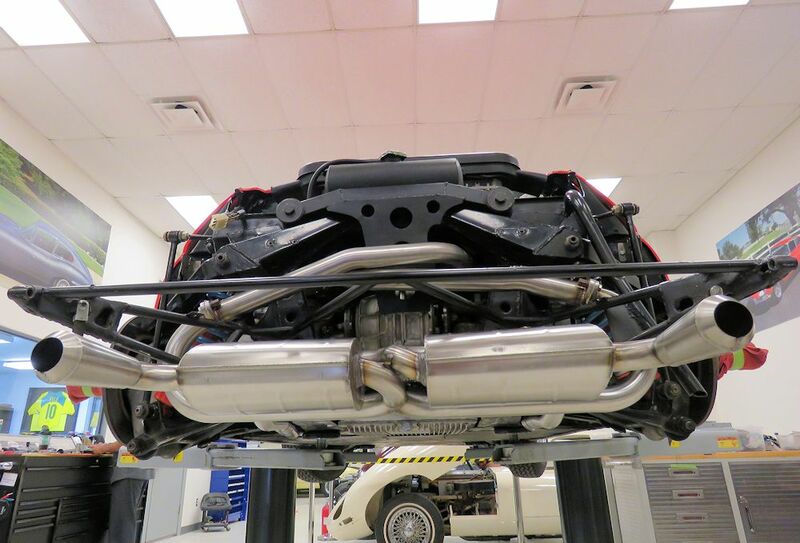 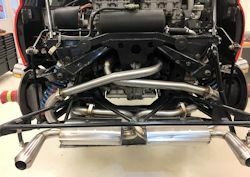 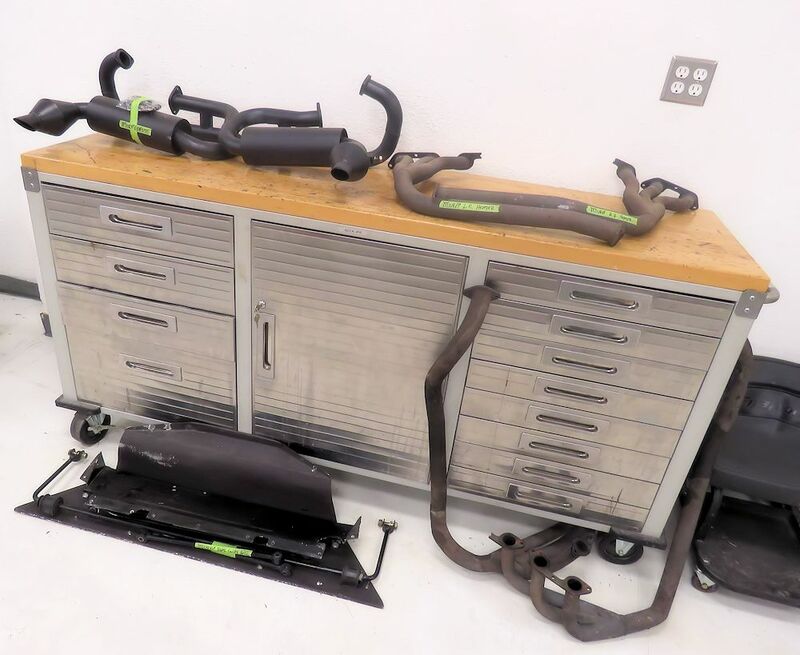 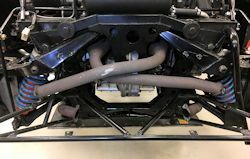 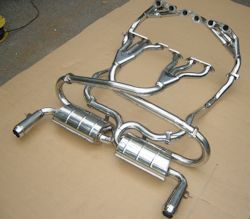 When the time comes to go back together with this project, we will upgrade the headers and exhaust with a superb quality replacement system from Quick Silver in England. 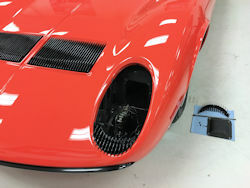 I am pleased to report that we now have this project underway. 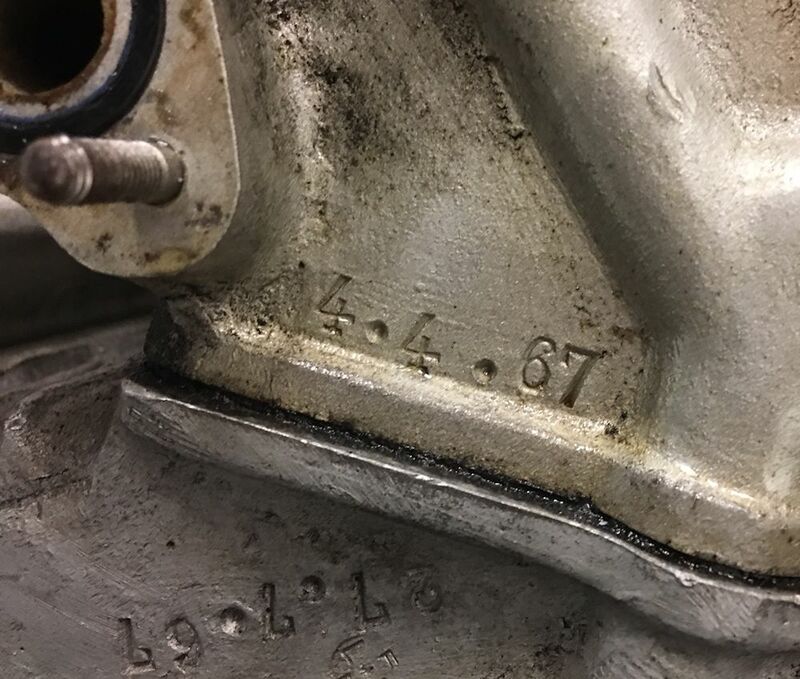 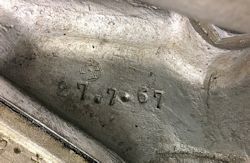 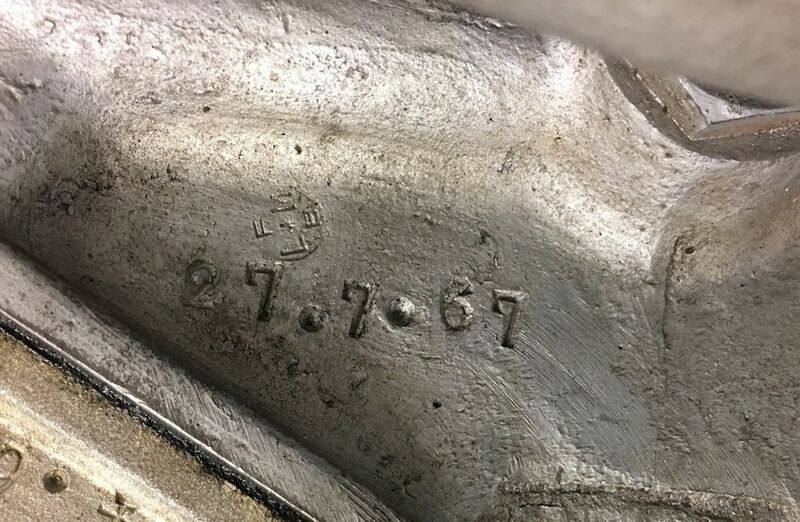 Interesting to note that the engine is date stamped July 27, 1967, meaning we removed it on its 50th birthday! 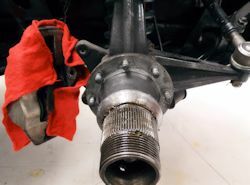 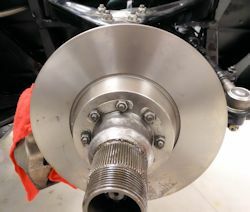 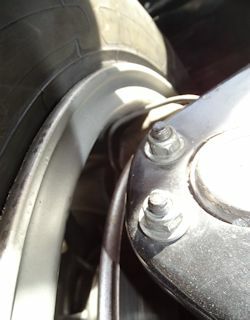 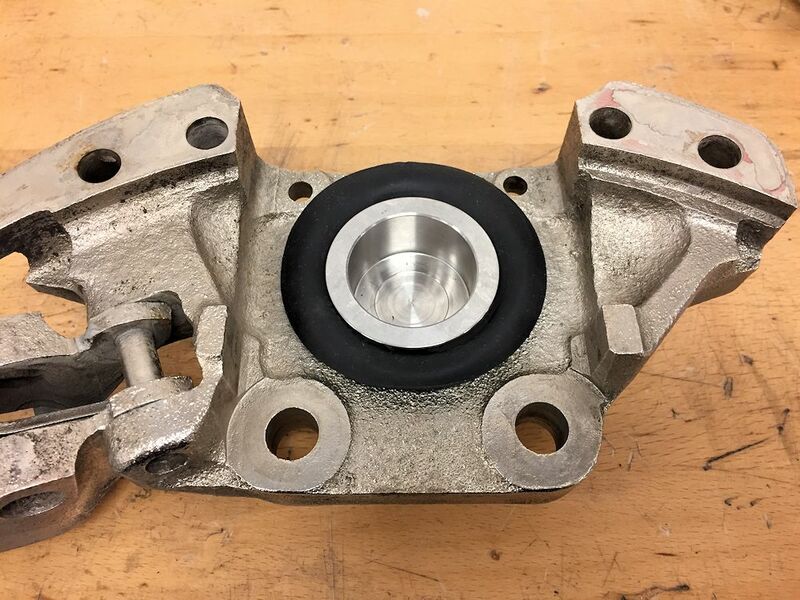 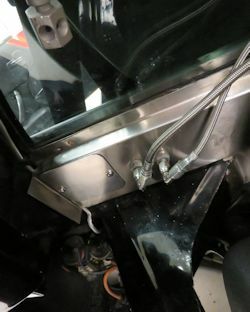 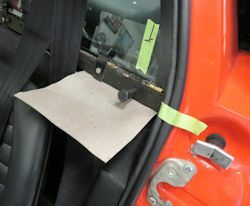 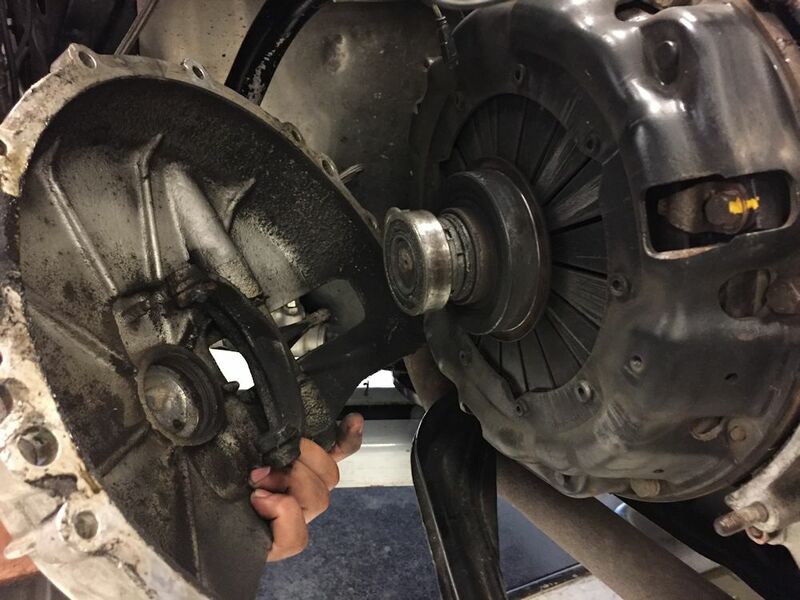 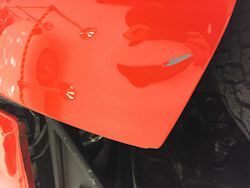 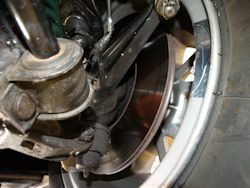 The following photographs cover the relocation of the driver's seat belt shoulder anchor, and the installation of new front brake rotors. Today we have been fabricating and installing new brake lines and balancing the road wheels. 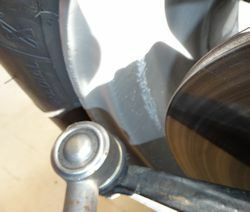 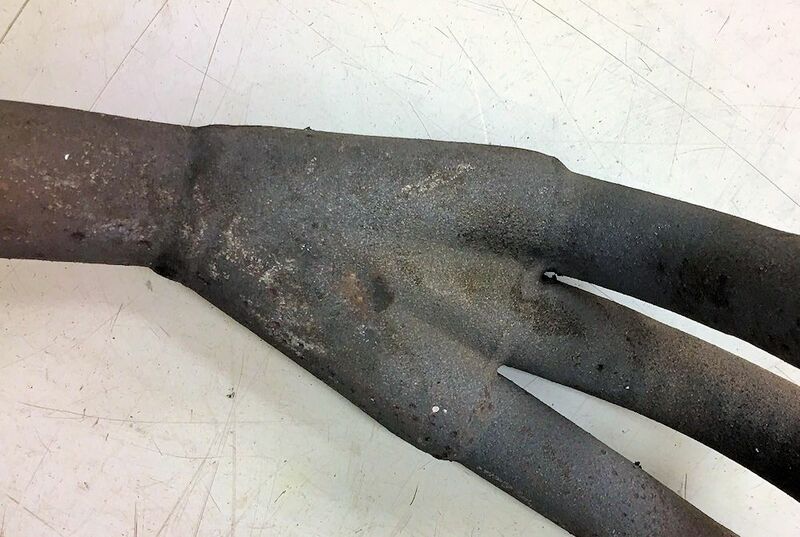 Previous balance weights had been glued in position where they contacted the calipers when the wheels rotated. 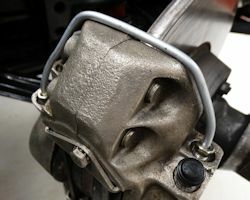 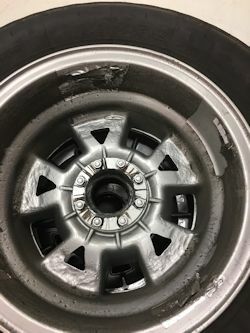 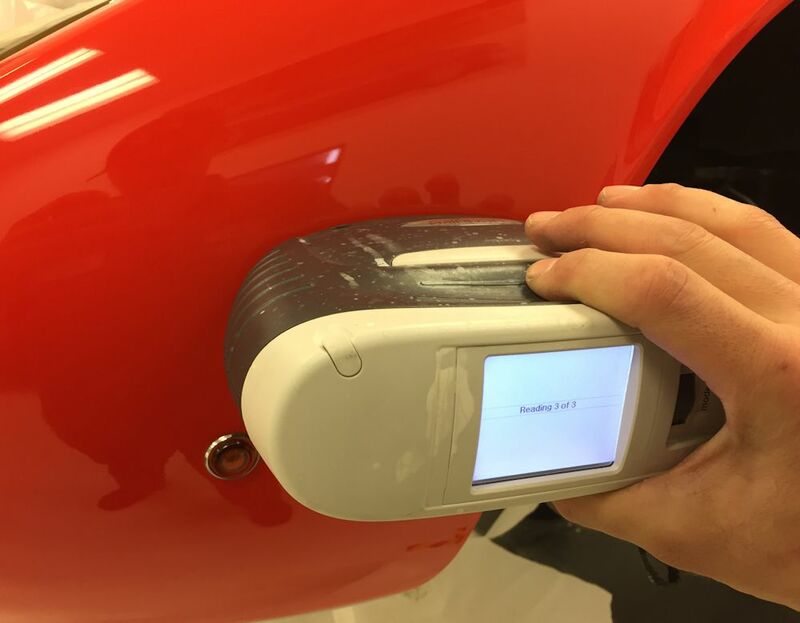 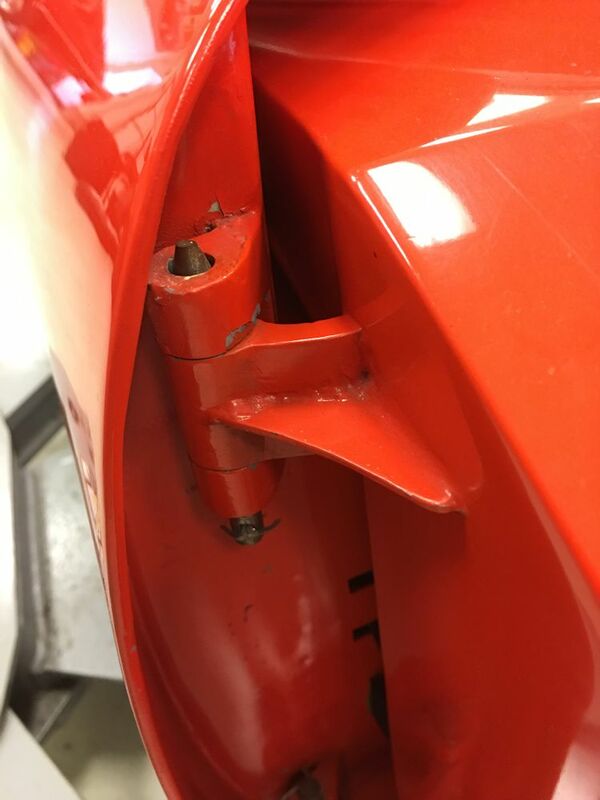 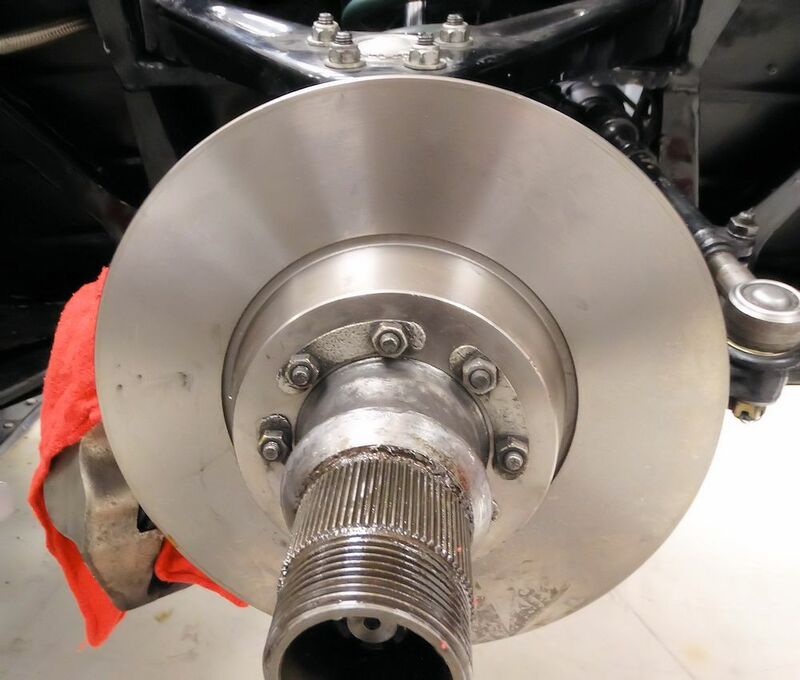 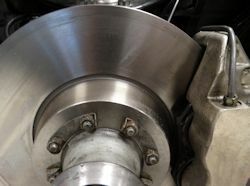 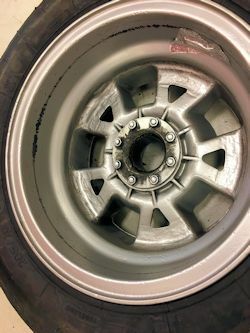 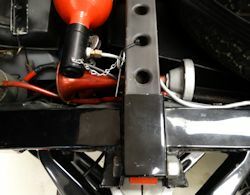 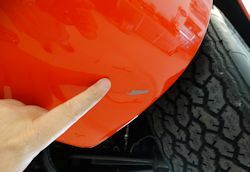 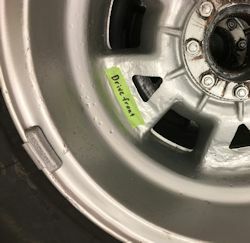 There is so little clearance between the top of the calipers and the inner surface of the wheel rim, that you really have to use clip on weights attached to the inner bead. Several of the old balance weights were missing altogether and others were barely attached. 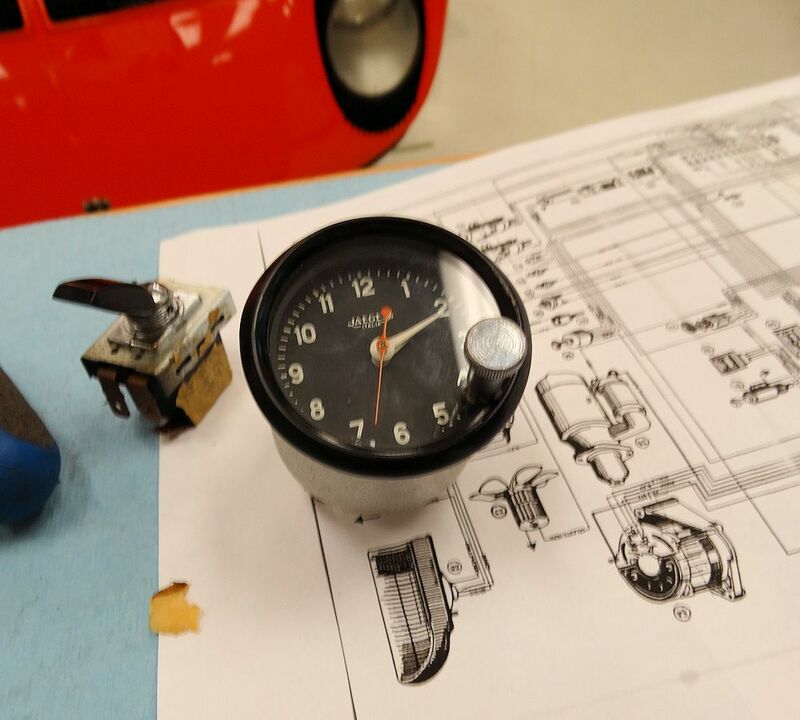 Another productive day working our way through several issues. 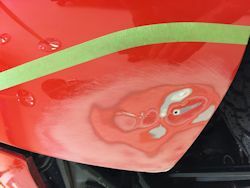 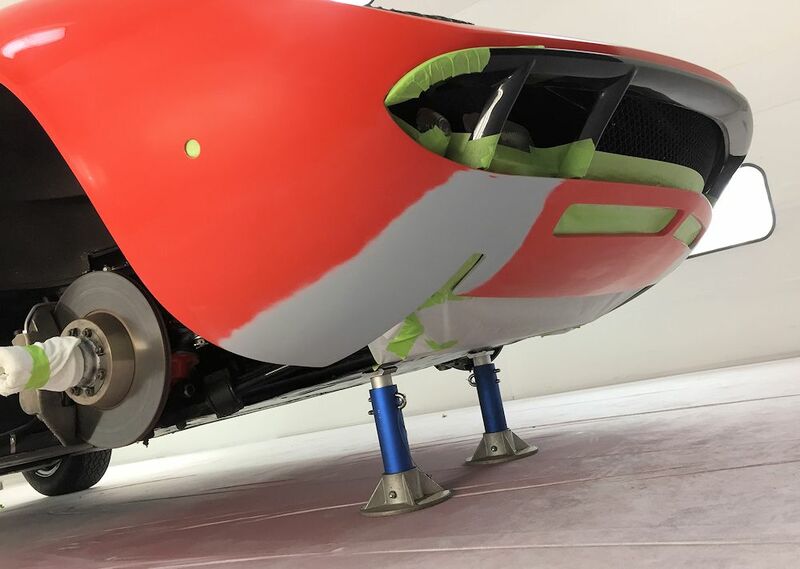 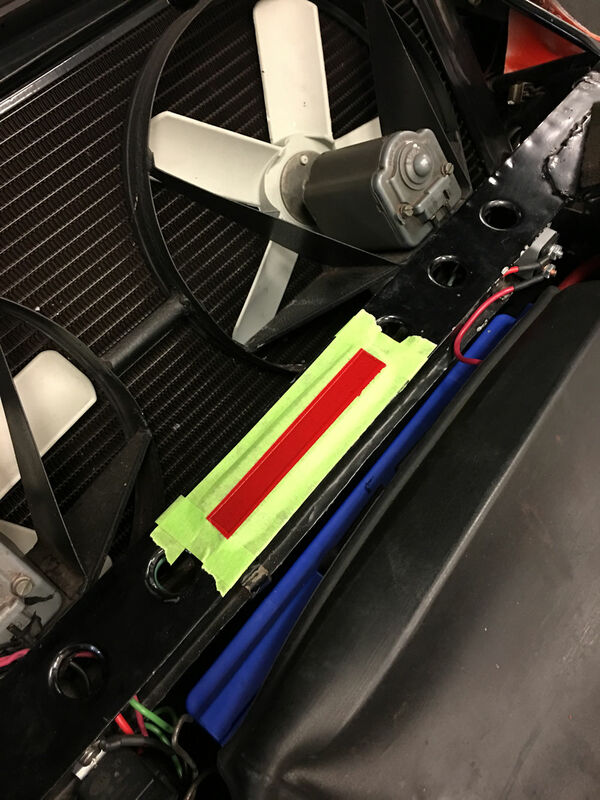 Unfortunately we discovered a few new issues, such as brake lines rubbing inside wheels, and defective air horns, etc, but we were still able to check off several items today. 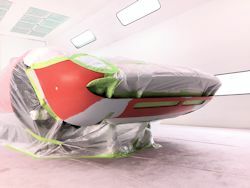 We are happy to get this new project underway. 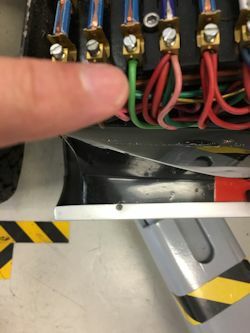 Our first task will be to address several electrical issues. 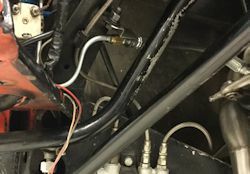 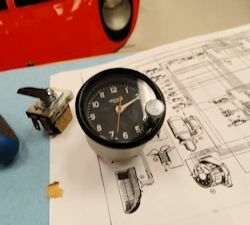 We have already rebuilt the right hand headlamp mechanism, installing a new bronze crank gear, rewired the headlamp motor and rebuilt and rewired the fog lamp switch. You now have fully operational headlamps and fog lamps.